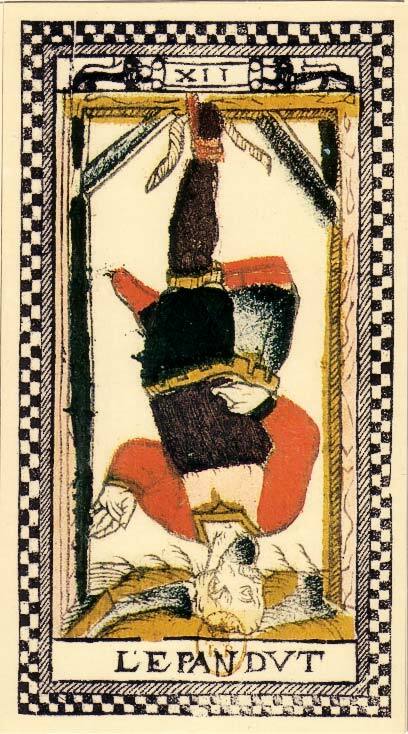 This only partially surviving deck is quite extraordinary both in structure and design. 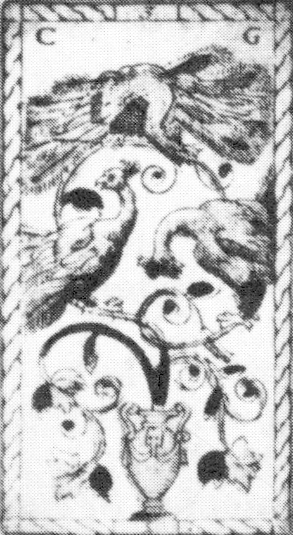 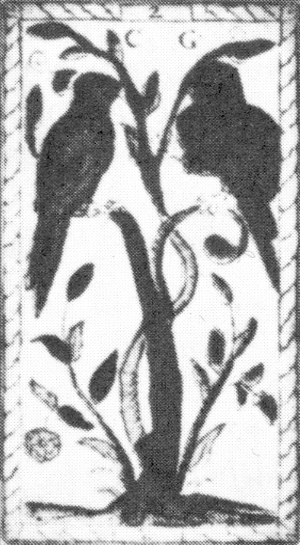 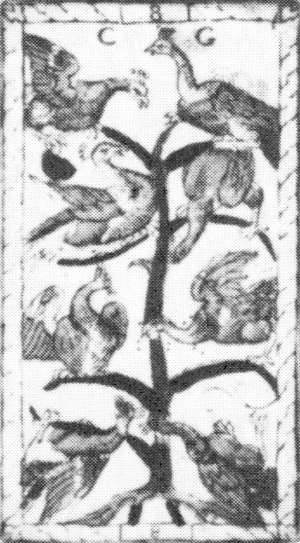 It is a stencil-colured woodcut deck with elaborate non-standard suit signs of animals and birds. 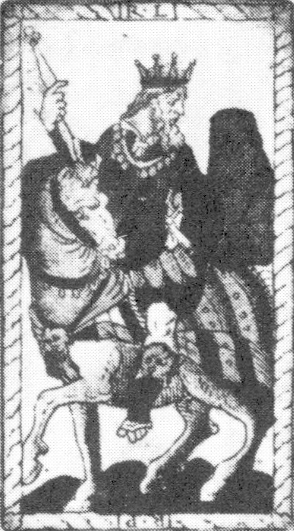 Atypically for a tarot deck it seems to have had only 52 suit cards, of which only half survive, oddly enough all from just three of the suits. 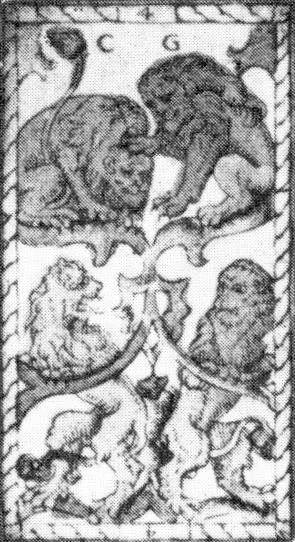 The trumps are numbered, and while only 12 of them survive, they form the oldest set consistent with the Marseilles order. 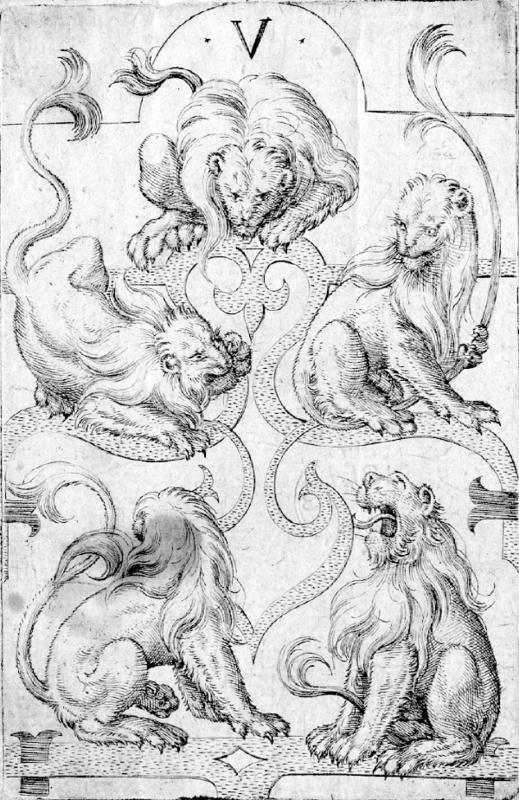 The designs are, however, quite distinct from those. 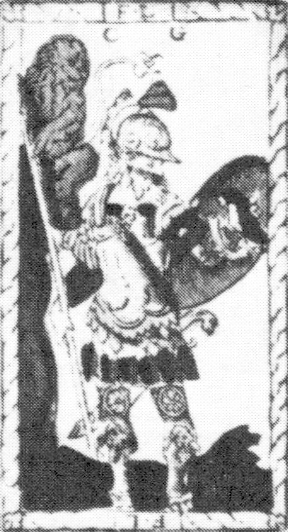 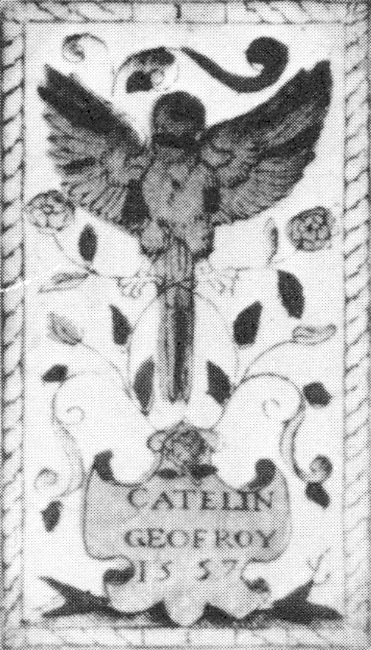 The cards measure 68×125 mm and are dated 1557 on both surviving aces, alongside the name Catelin Geofroy . 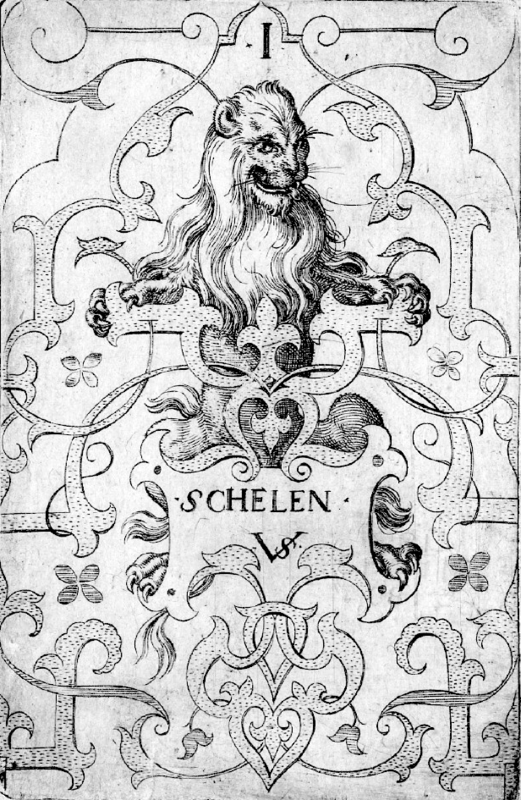 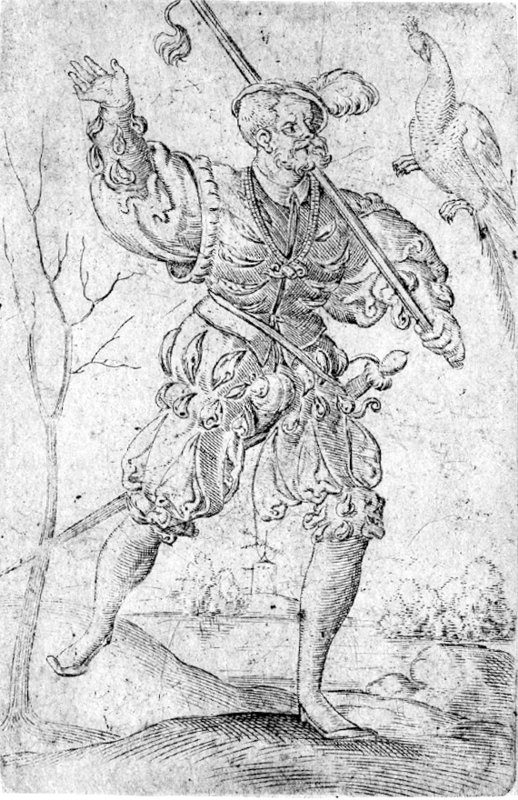 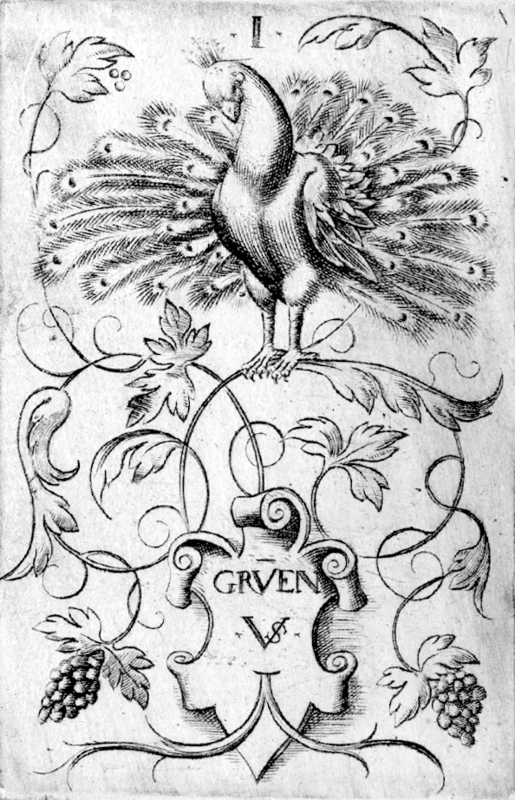 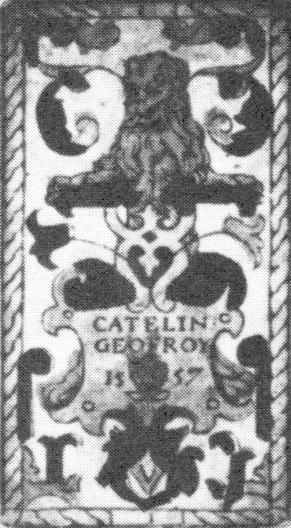 This man is known to have worked as a cardmaker in Lyons from 1582 to 1603 – in that source the name is spelled Catelin Geoffroy , and in yet another Cathelin Geoffroy . 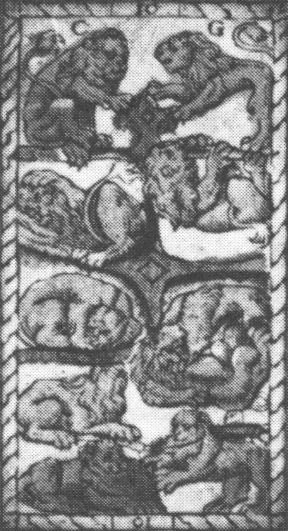 No copies are known besides the 38 cards in the Museum für Angewandte Kunst, Frankfurt am Main. 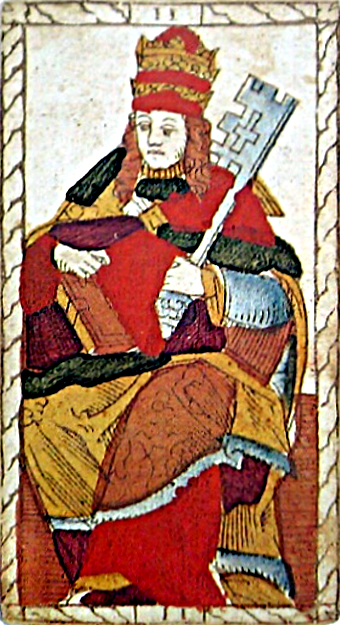 The total number of cards were probably 74, differing from normal tarots in lacking knight cards. 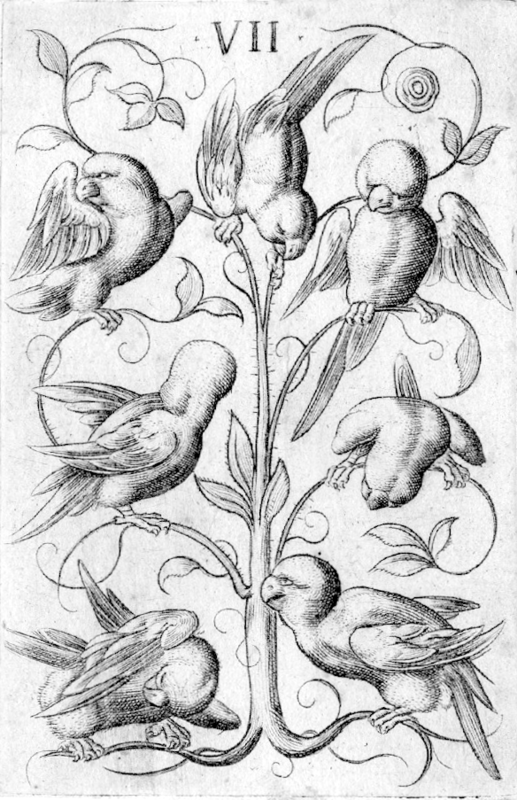 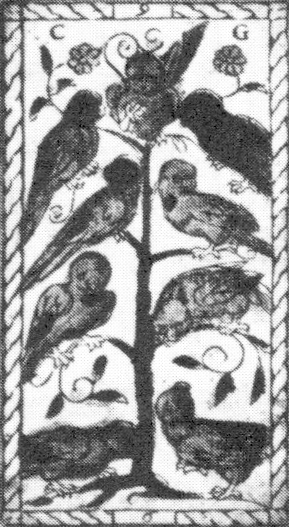 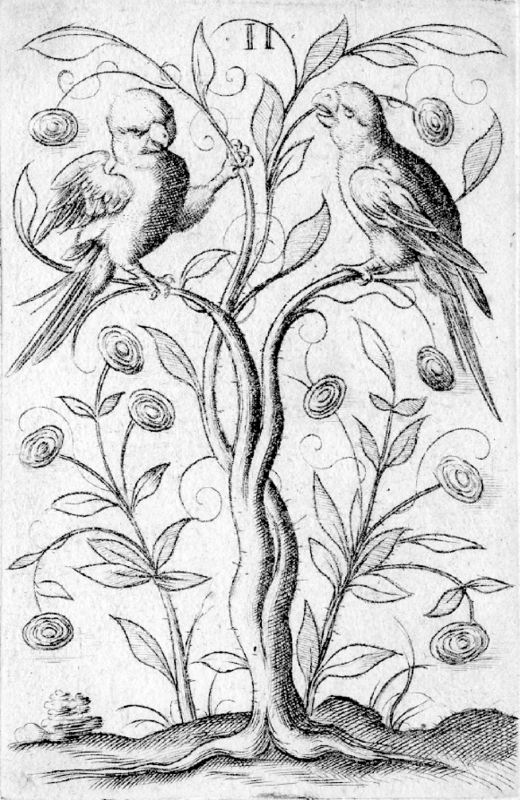 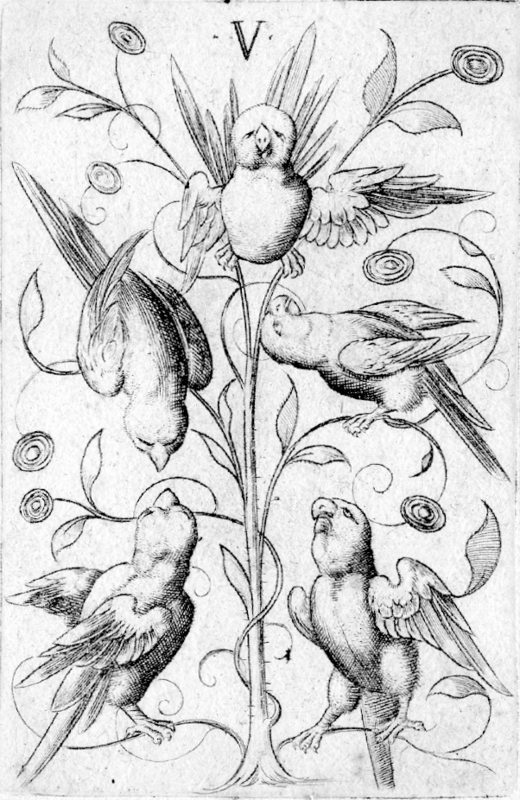 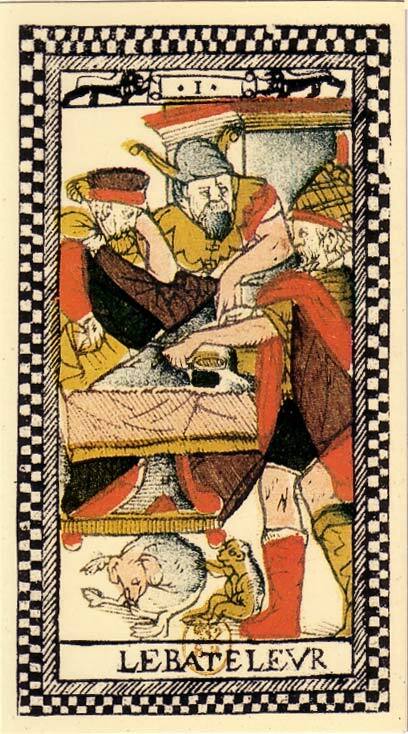 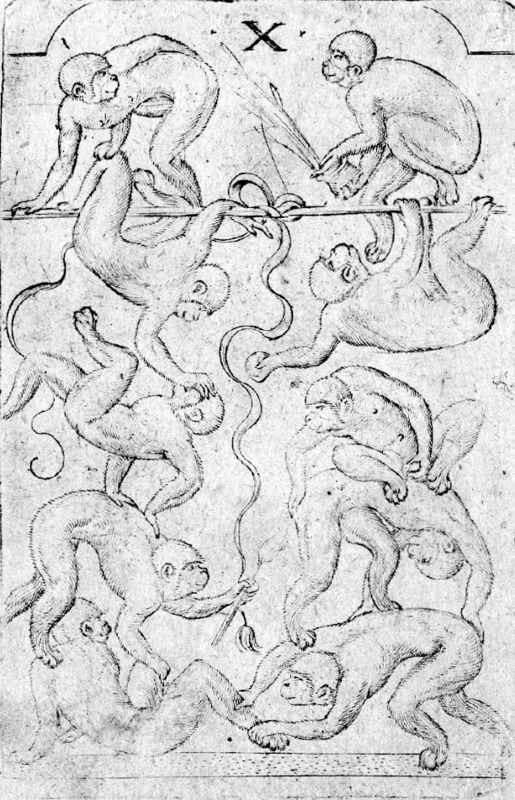 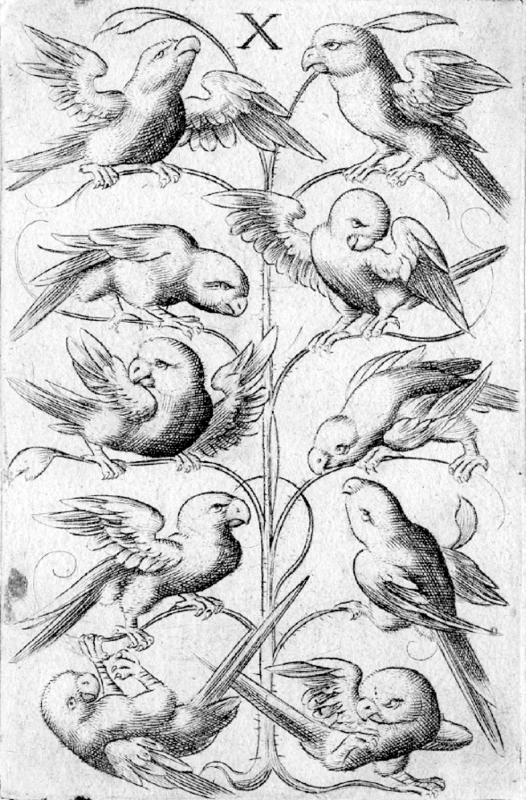 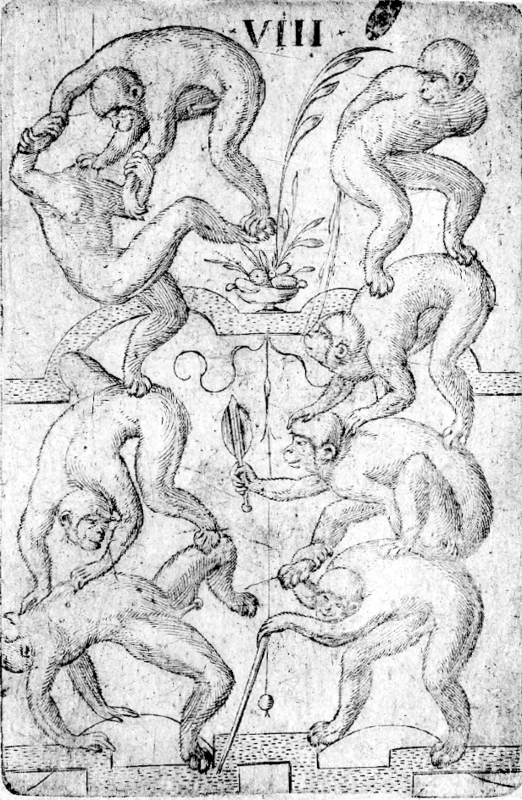 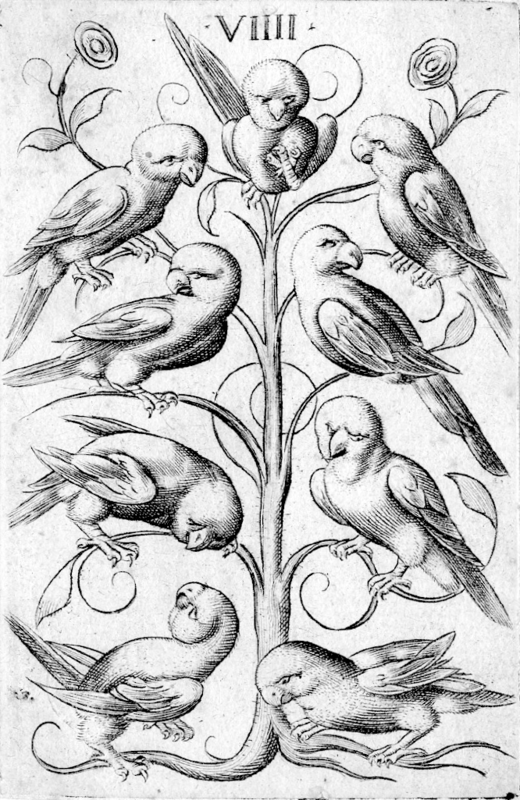 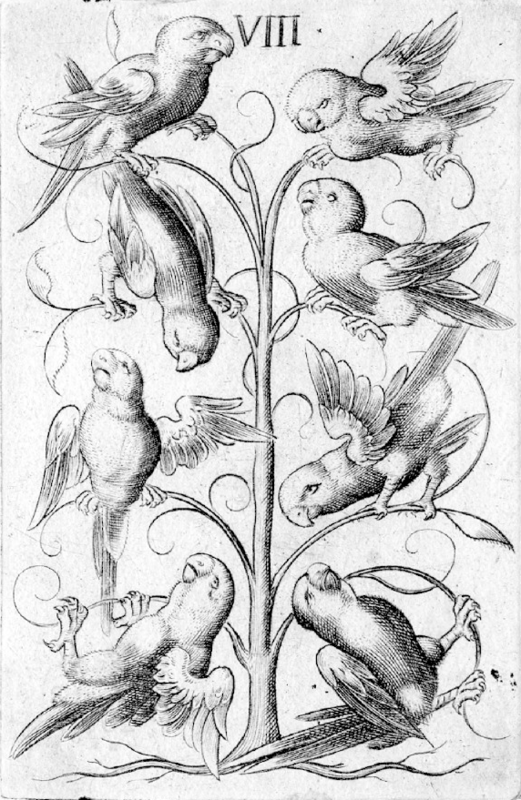 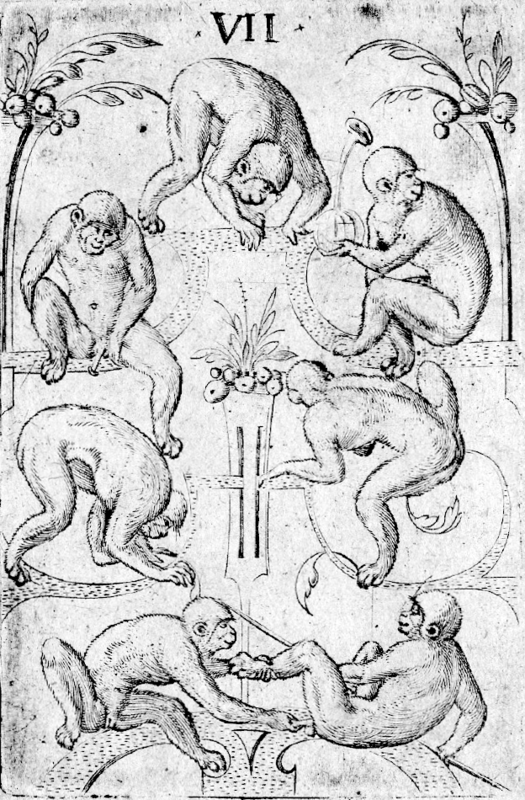 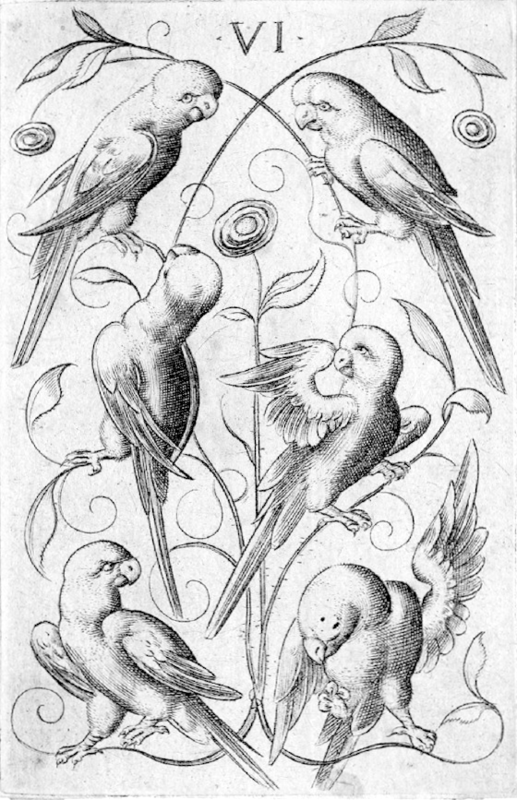 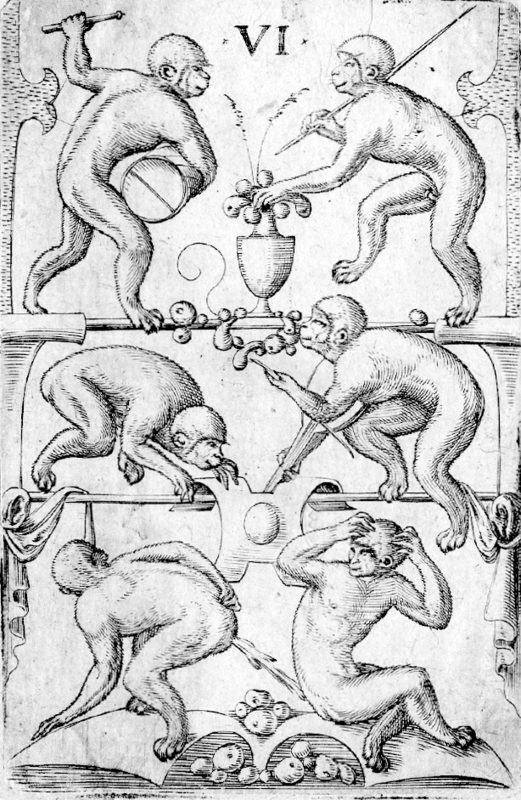 The pip cards are mirror-image reworkings of the engraved deck by Nuremberg artist Virgil Solis from c. 1544. 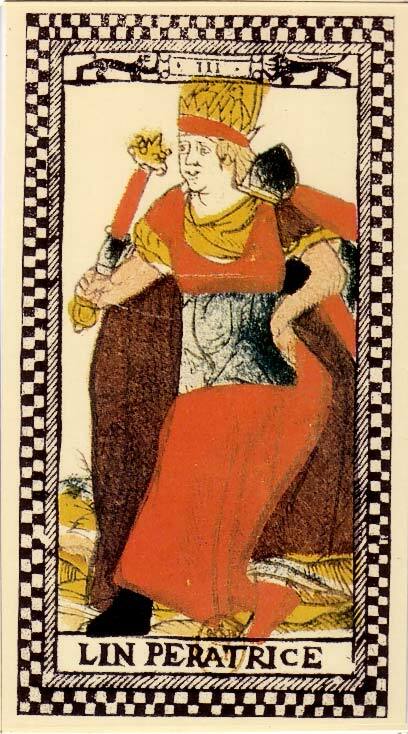 The court cards are more loosely based on those from the same deck, but still in a similar style. 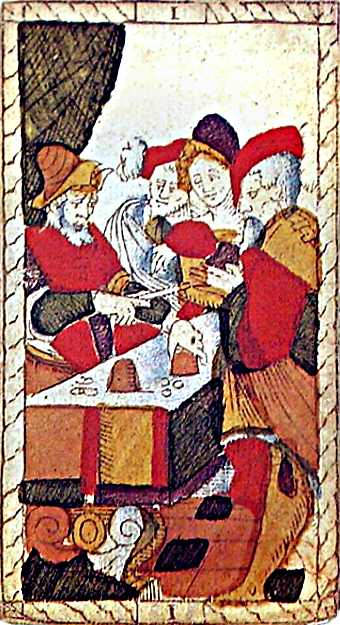 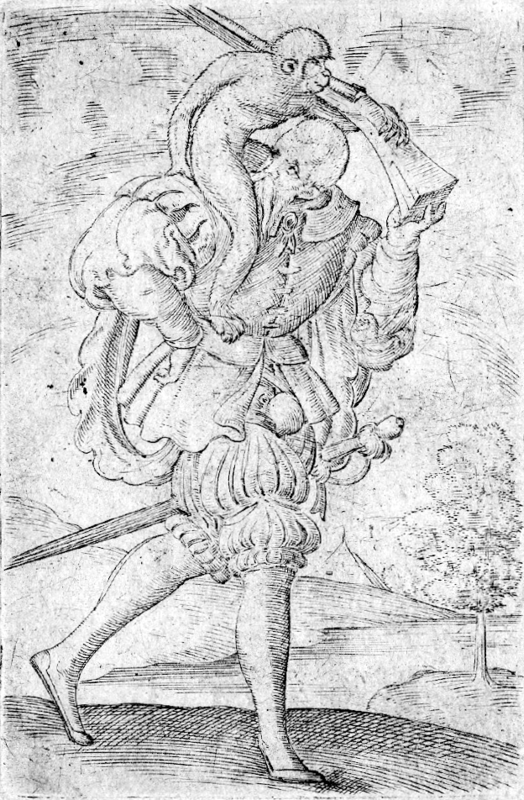 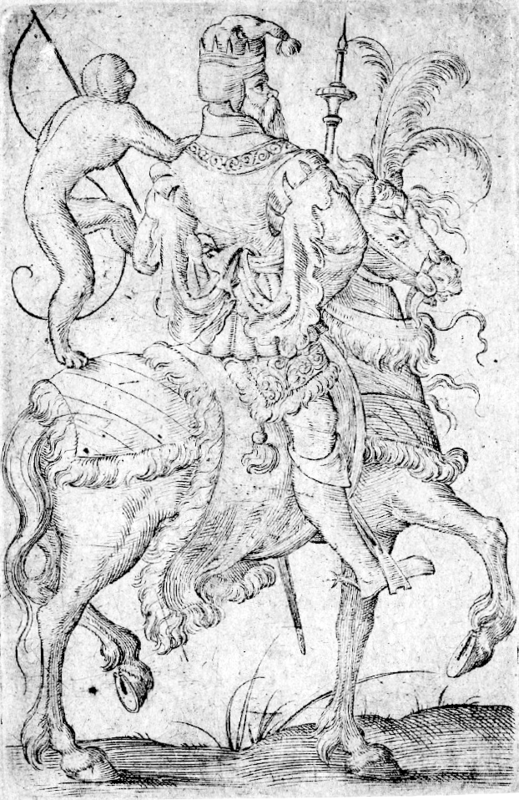 The Virgil Solis cards are firmly rooted in the German luxury card tradition, and bear a strong resemblance to the five-suited deck by Master PW from c. 1500. 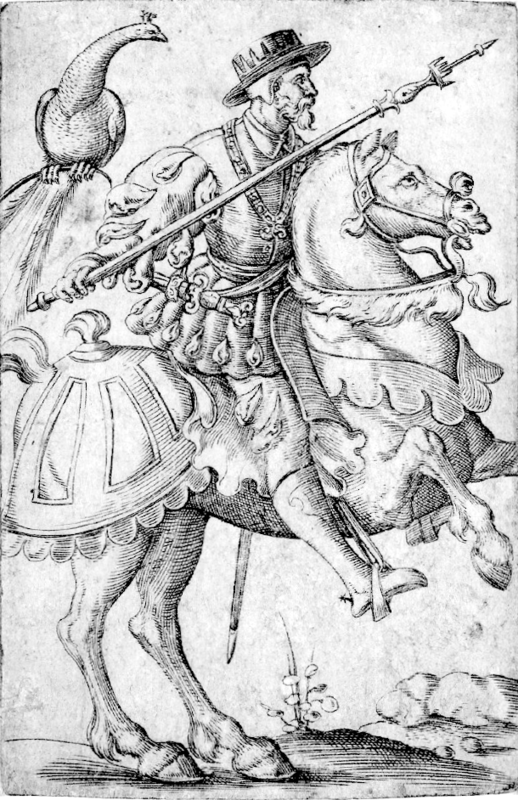 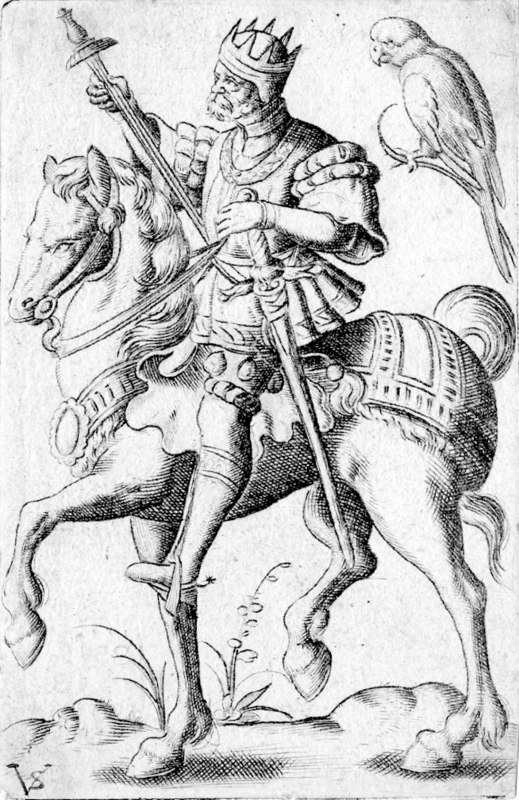 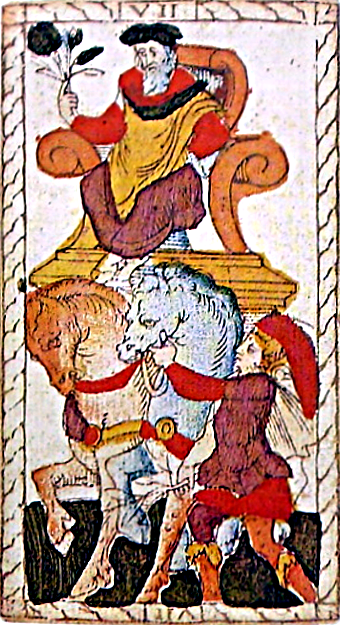 In contrast to the contemporary mass-produced German cards, but like most luxury decks, both retain the ones (aces) and add queens (who like the kings are depicted on horseback). 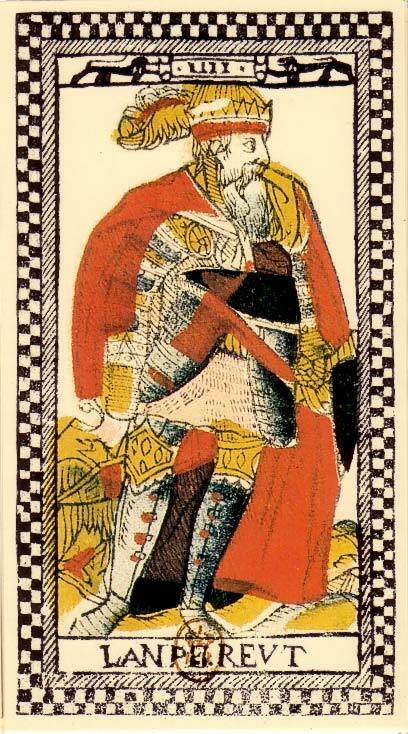 The PW deck has upper and lower knaves (Ober and Unter) as usual for German cards, but in many sets the lower knaves (as well as one of the five suits in its entirety) were removed, resulting in a deck with the structure of French decks: 1–10, knave, queen and king. 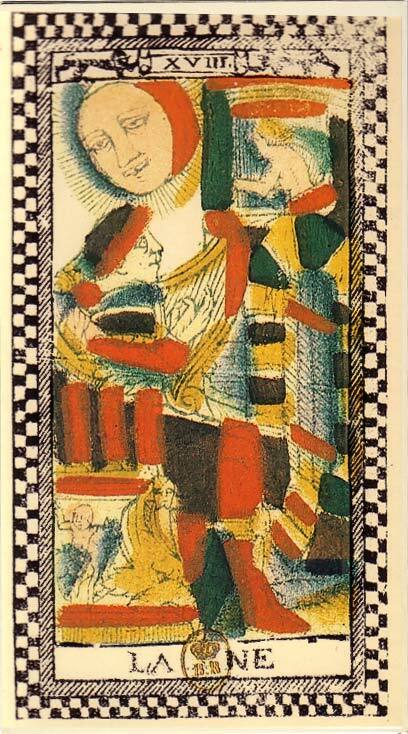 The Virgil Solis cards has this structure from the outset. 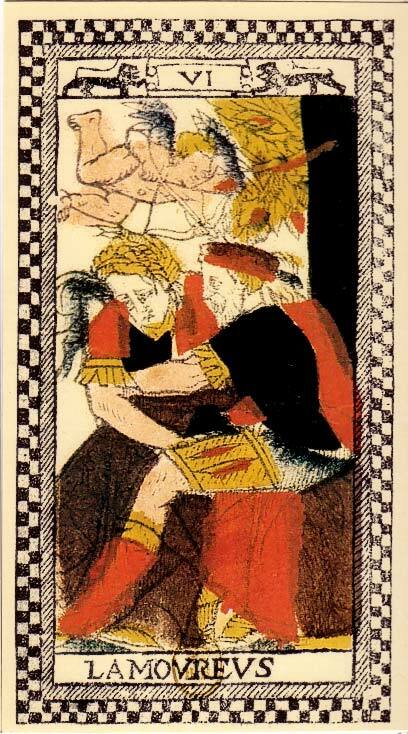 The Catelin Geofroy cards are somewhat narrover than the Virgil Solis cards, and add a border reminiscent of the frame formed by folding the edges of the paper with the back design over the front of the cards as common in South European decks. 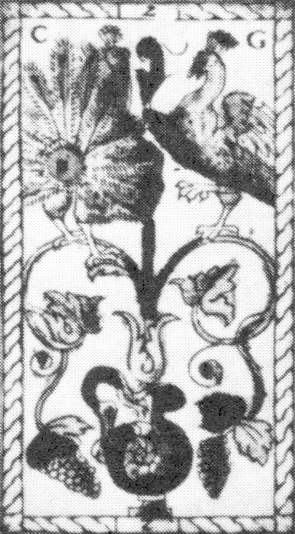 However, this is part of the front print, and contain indices at the top and bottom as in some South Italian decks of the Portuguese type. 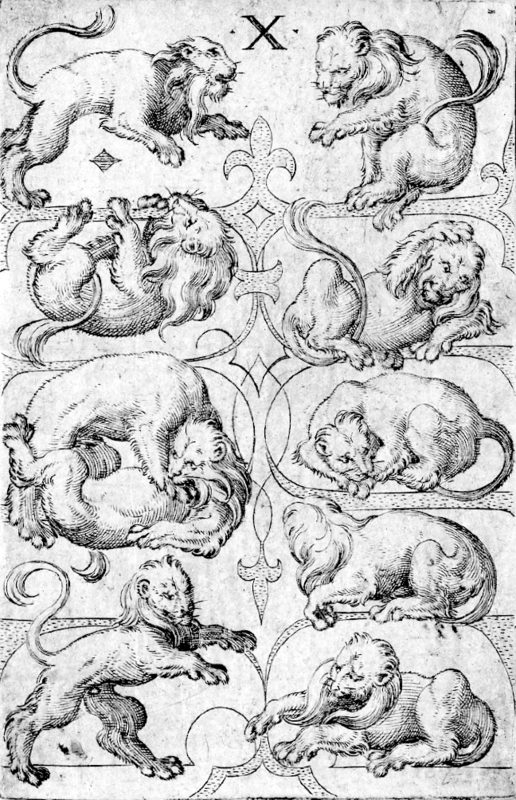 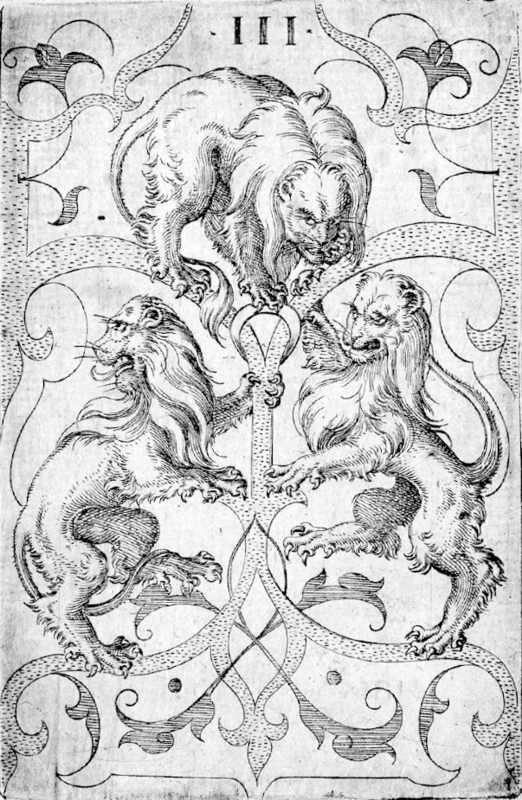 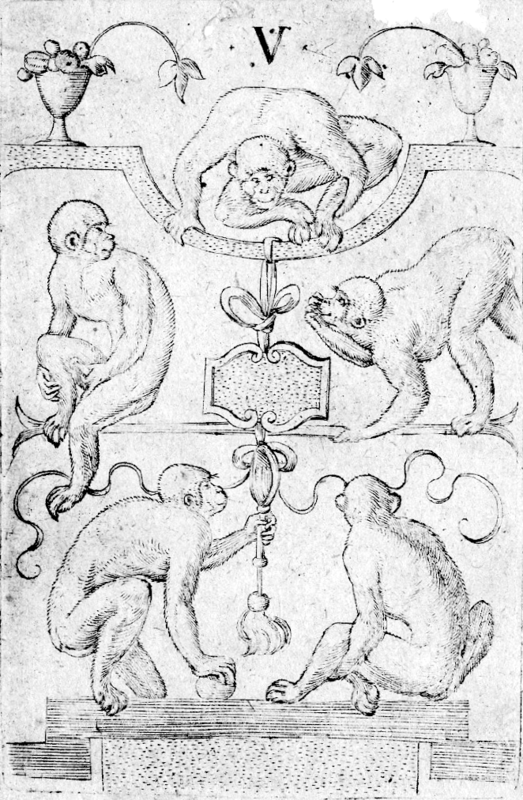 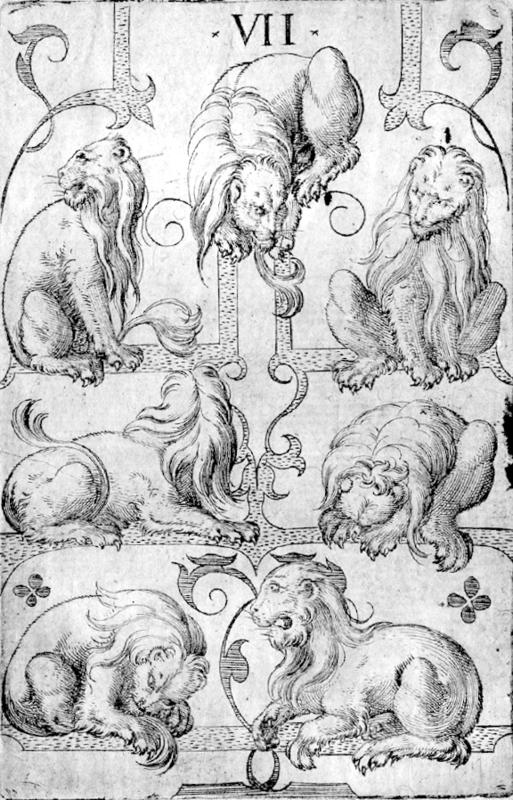 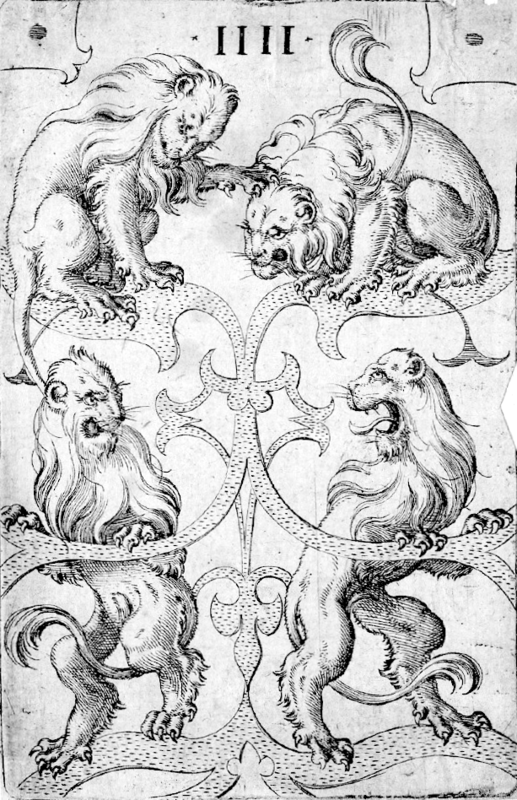 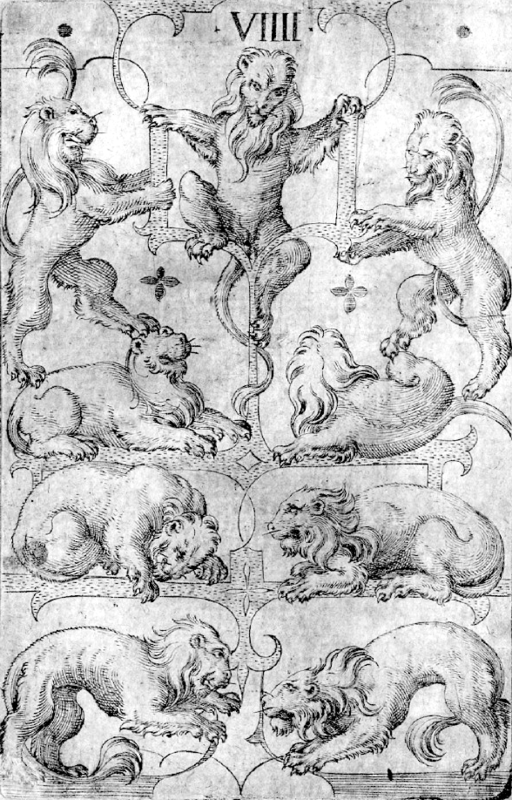 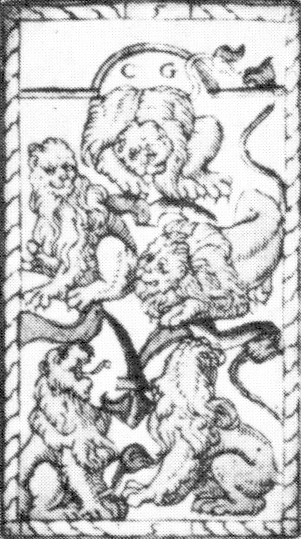 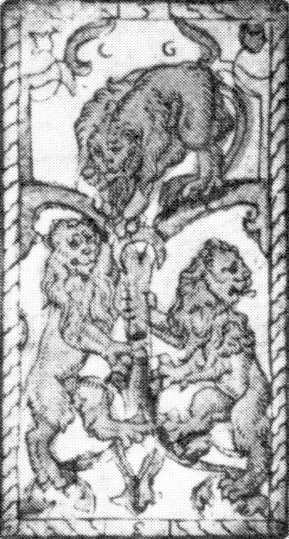 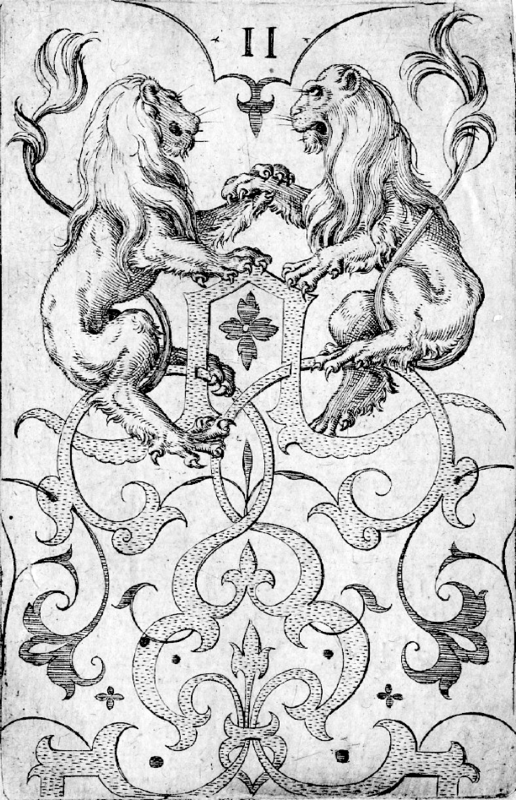 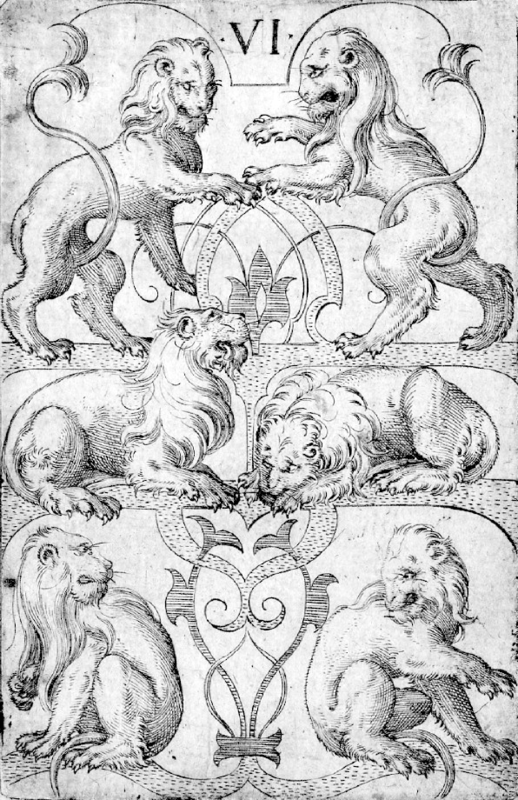 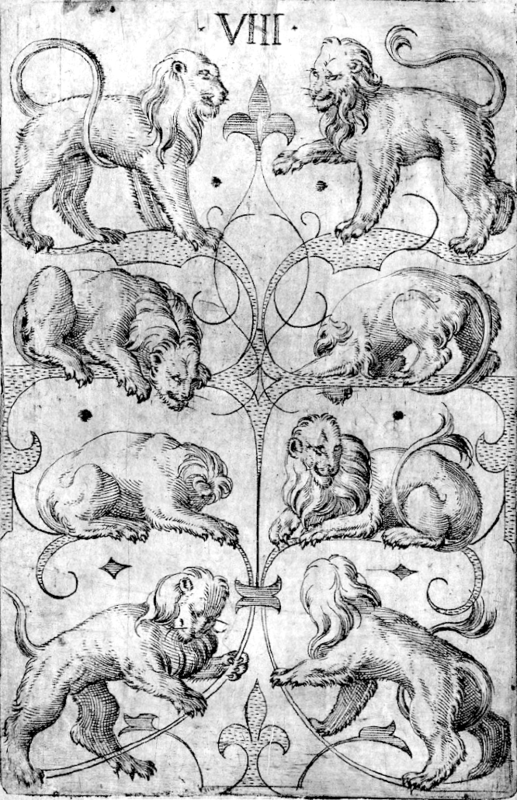 The sole surviving knave card has the legend F L . This can only be interpreted as Italian fante di leoni (knave of lions), and all other indices are consistent with this. 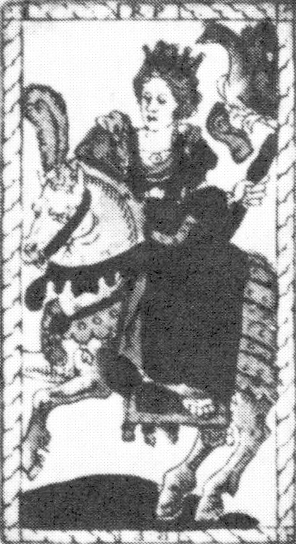 Not only tarots, but any cards for an Italian market would be expected to also contain knight or cavalli cards, but the queens and kings being mounted would make introducing this awkward. 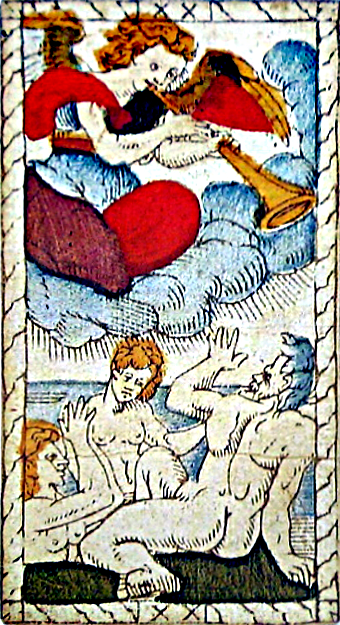 Hence, it is most probable that there were only 4×13 suit cards. 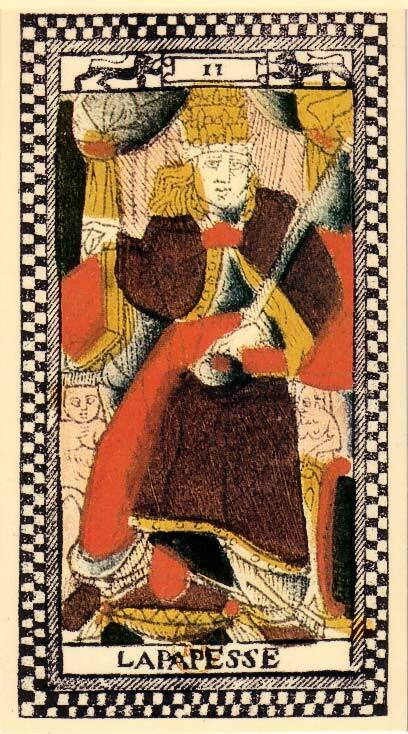 Both the PW and Virgil Solis cards subtly marks two suits as weak – i.e. 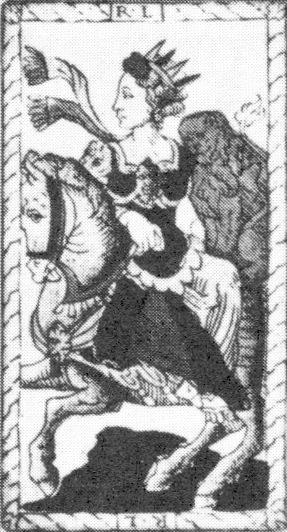 that lower numbered pip cards beat higher ones – by having leftward-facing court cards. 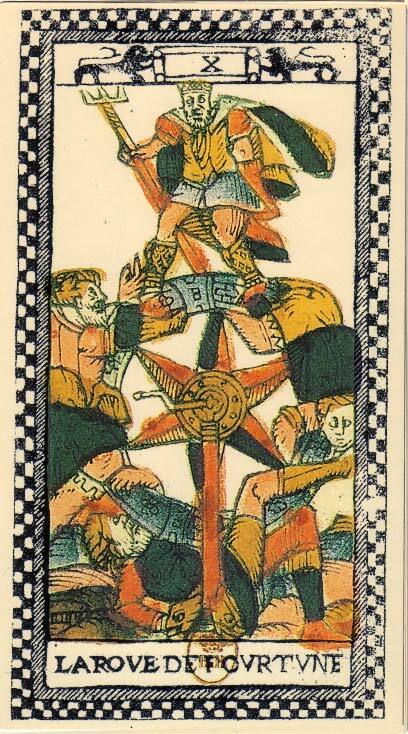 In the Virgil Solis deck, the aces bear shields with the name of the corresponding standard German suit sign. 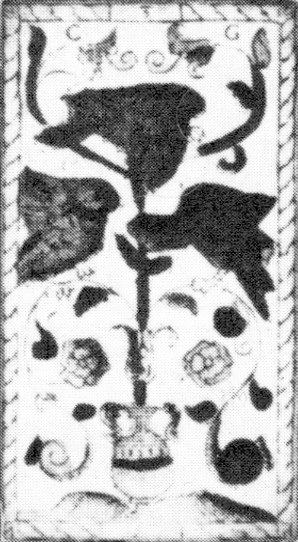 The weak suits are hearts and bells, which again correspond to hearts and diamonds in French-suited cards. 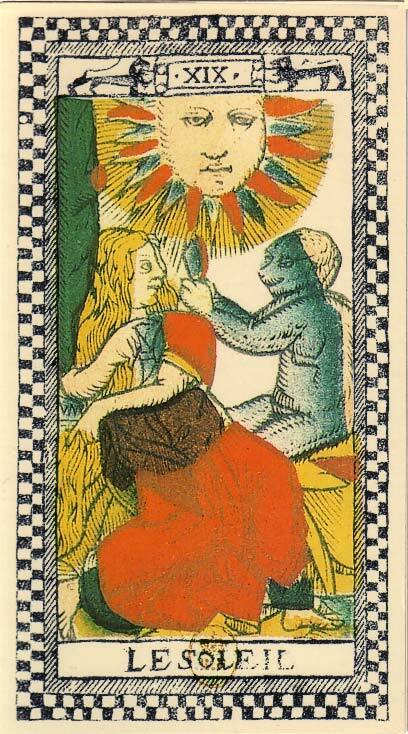 These two (the red suits) are the ones that are weak in games having this distinction when played with French-suited cards, tarot or non-tarot. 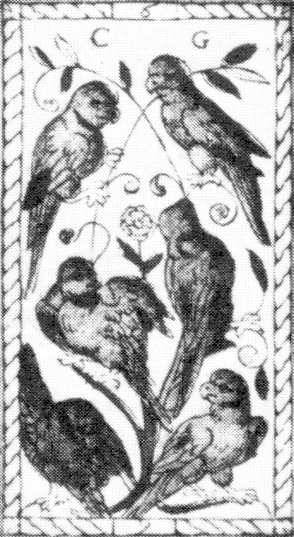 The Catelin Geoffroy cards do not maintain this pattern, though. 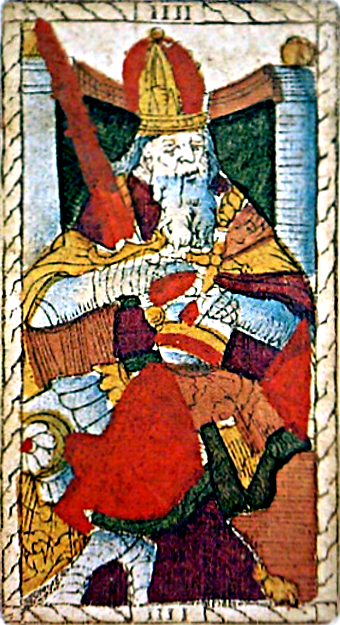 The trump cards does not have equally close ties to other sets. 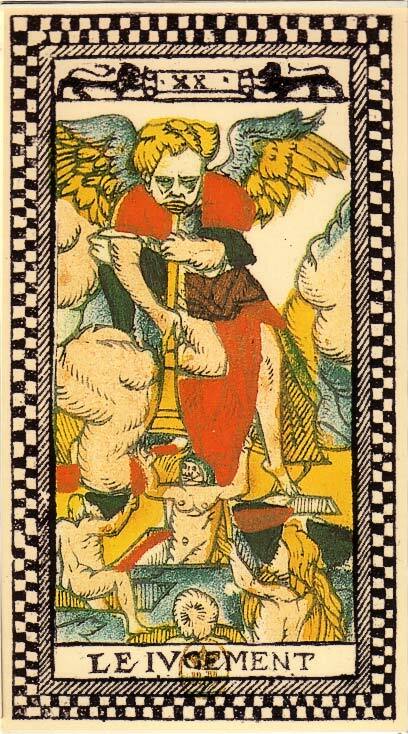 Probably the closest overall is Tarot de Paris from c. 1620. 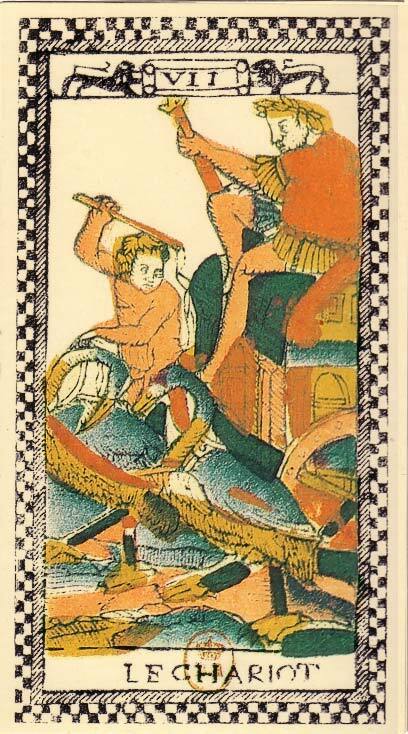 However, for some individual cards, closer matches can be found in other decks. 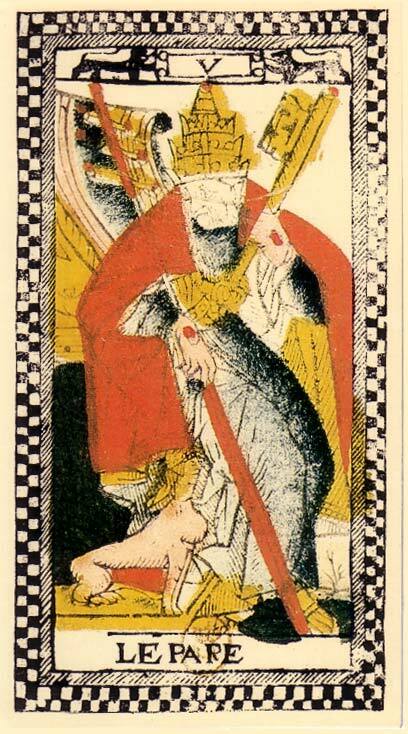 The closest matches are the insignia carried by the popess, the empress and the pope. 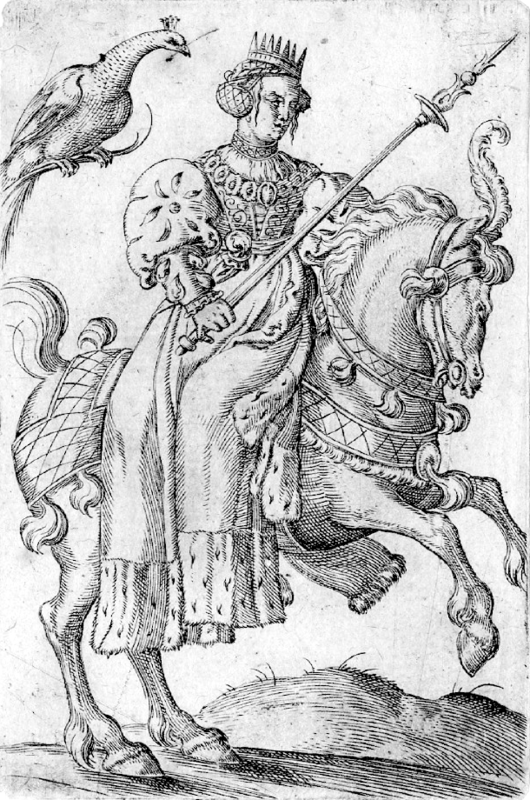 The popess wears the papal triple tiara, and holds a closed book in her right hand and a single oversized key in the left. 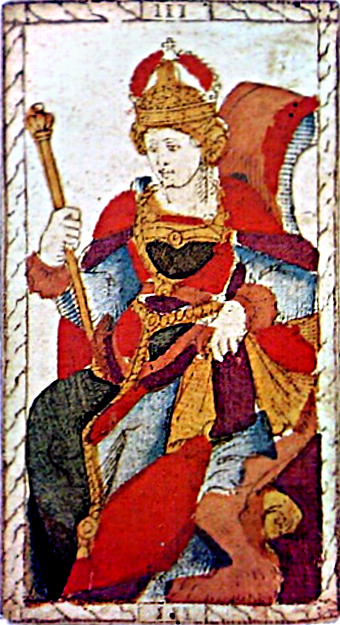 The empress wears an imperial crown with high arches, without a mitre, and holds a sceptre in her right hand. 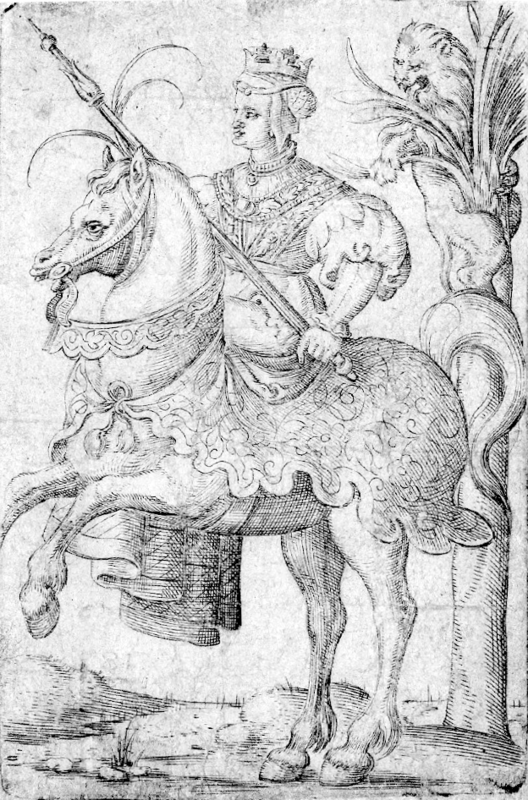 The pope wears the papal triple tiara and episcopal gloves. 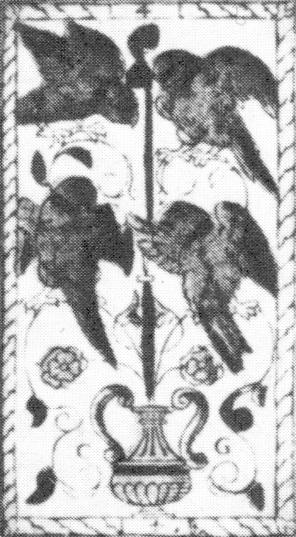 Unlike in many other decks, the backs of these are not decorated with crosses formée, but instead with two concentric circles. 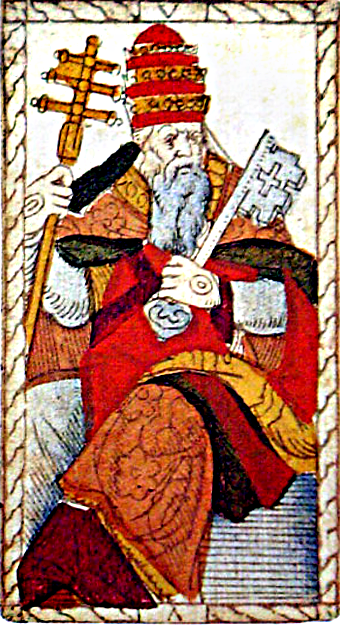 He holds the triple-barred papal cross or ferula in his right hand and like the popess a single oversized key in the left. 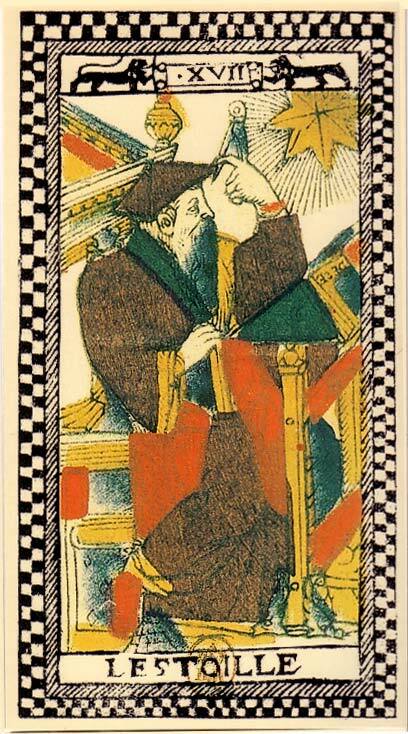 The emperor cards on the other hand are quite dissimilar in this respect. 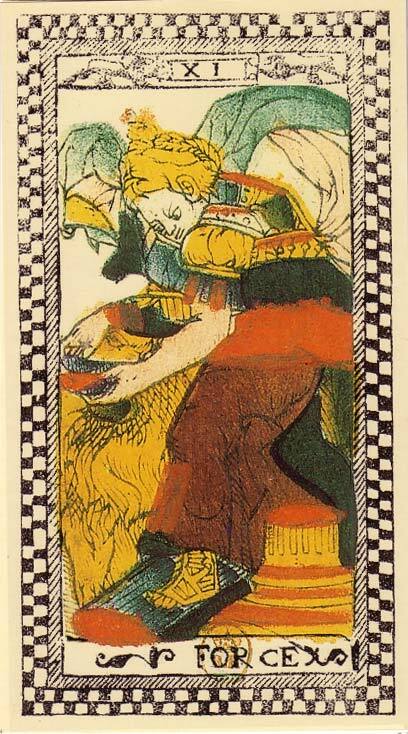 The magician cards share the not uncommon but far from universal feature of including members of the audience, but do not have other similarities of significance. 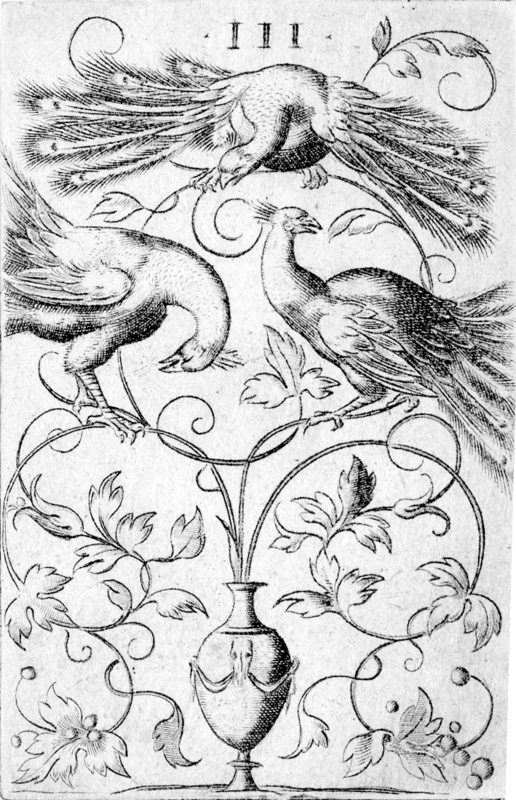 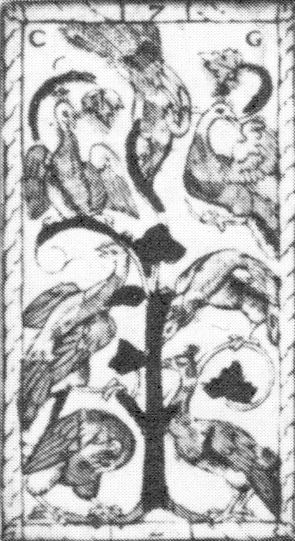 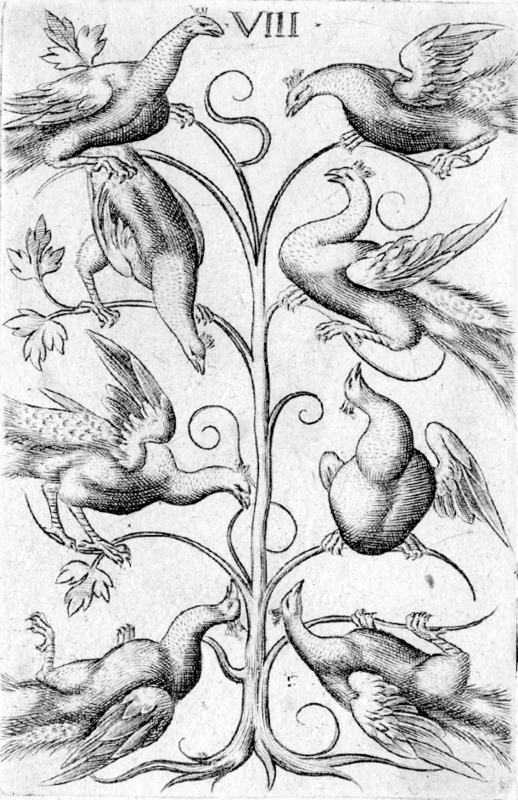 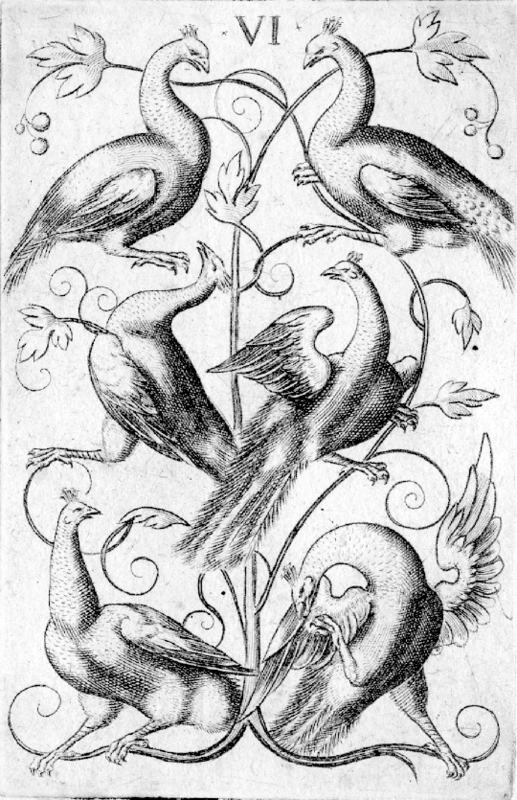 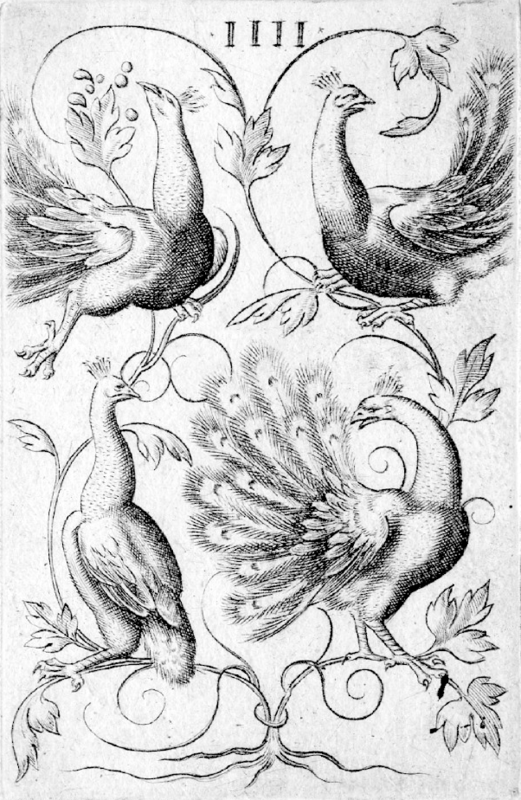 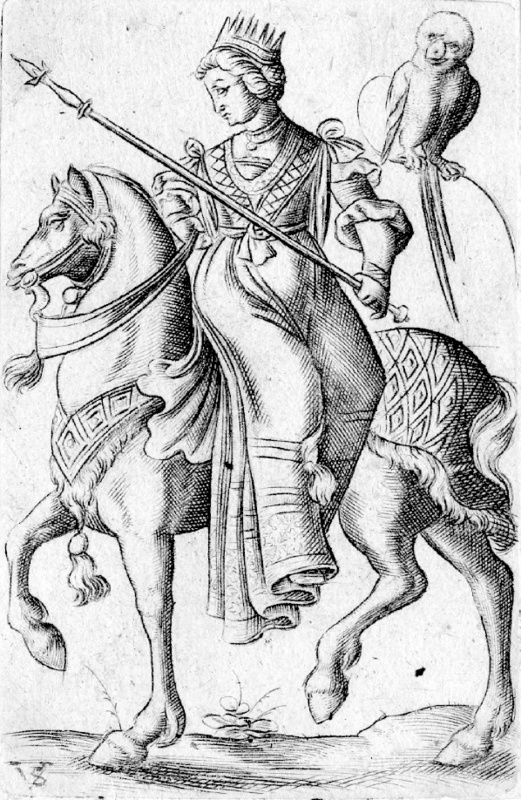 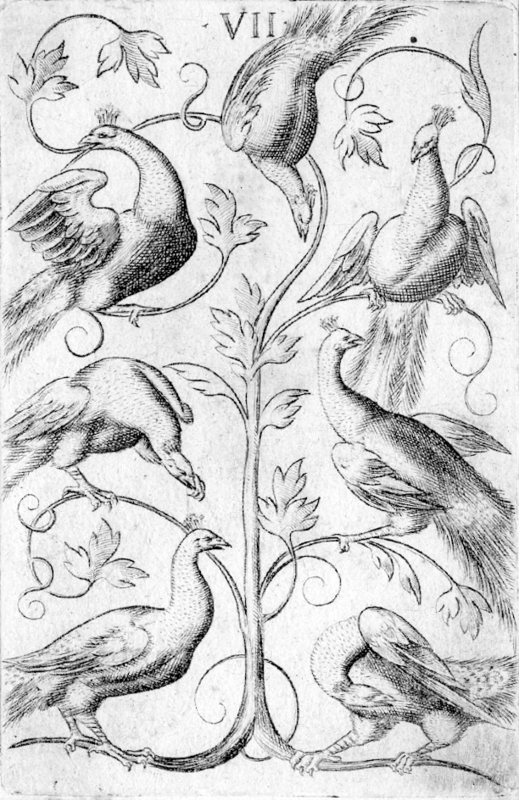 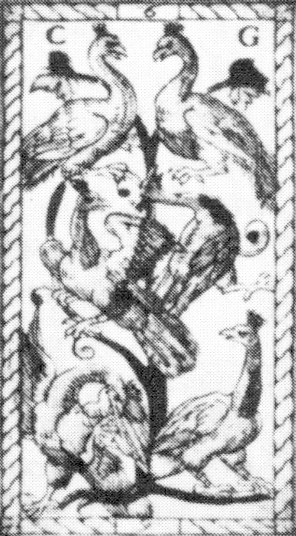 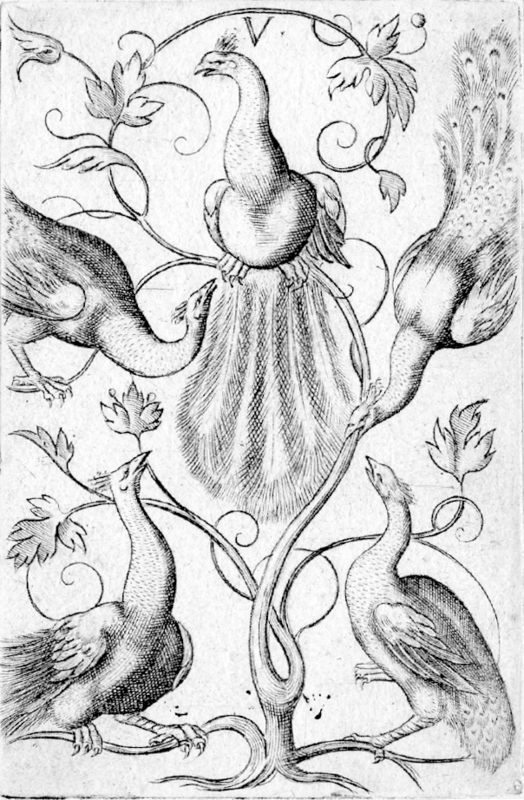 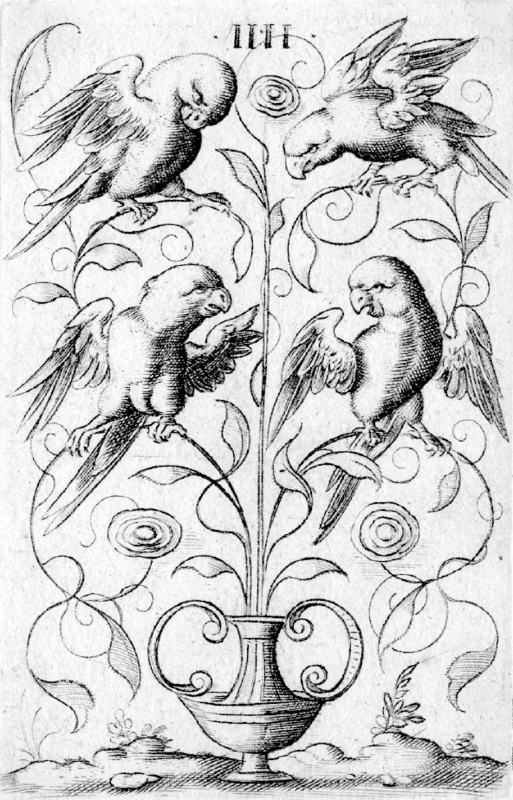 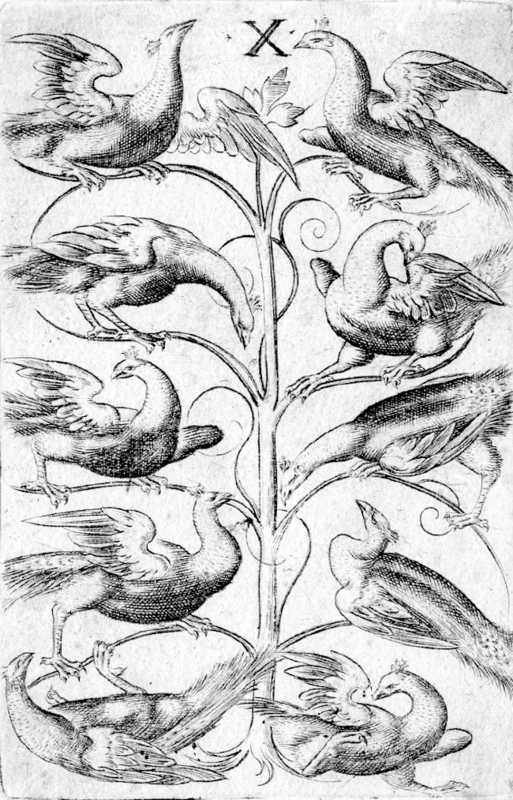 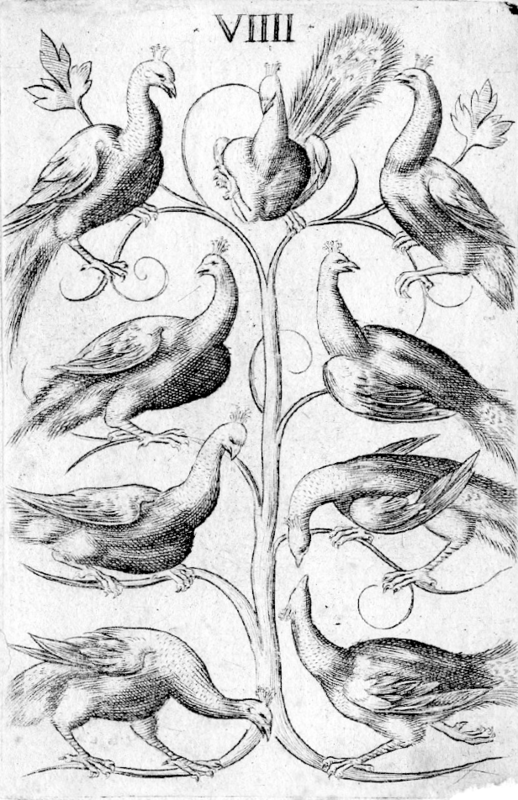 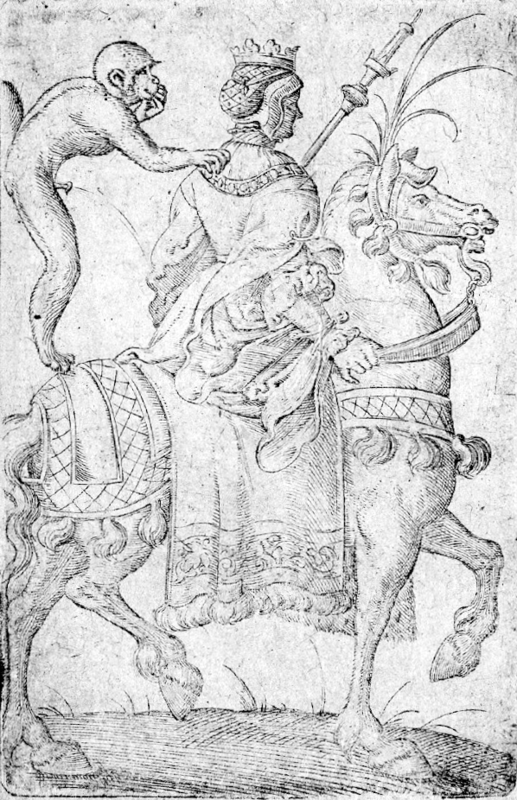 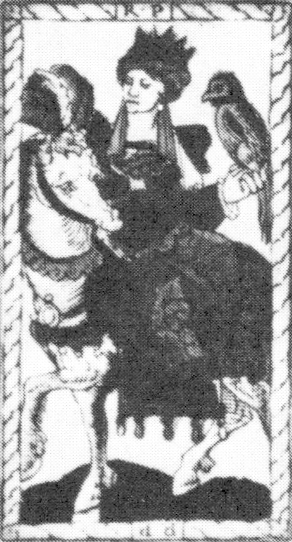 The chariots are quite dissimilar, though both have a single adult male passenger and a younger male who attends the pair of draught animals – horses in the Catelin Geofroy card, but large birds in Tarot de Paris. 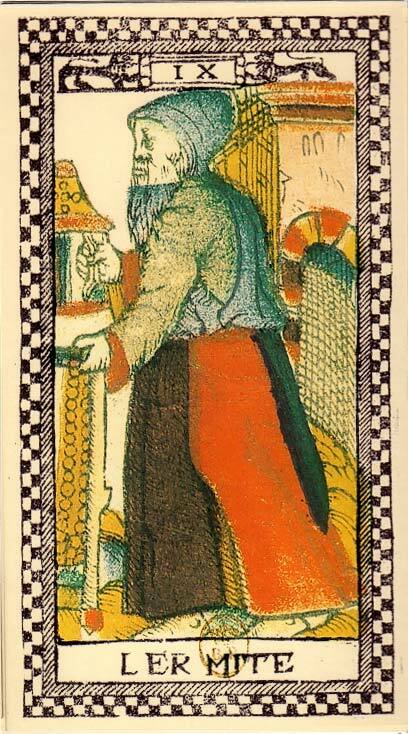 In both decks the transition from time to hermit is complete. 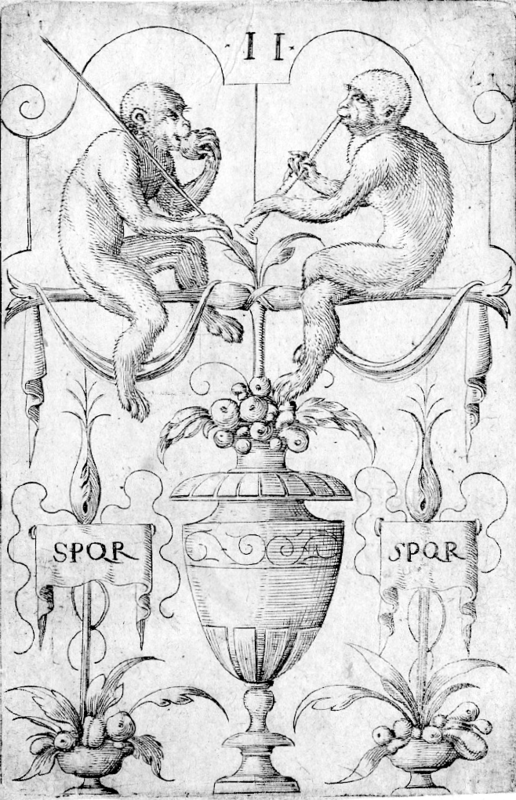 Both are wearing monk-like garbs and carry rosaries, and hold something unidentifiable in their right hands. 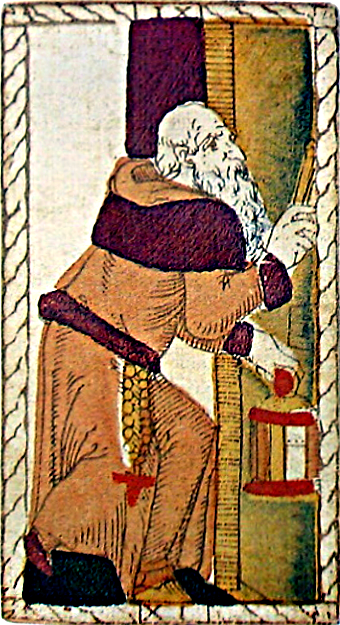 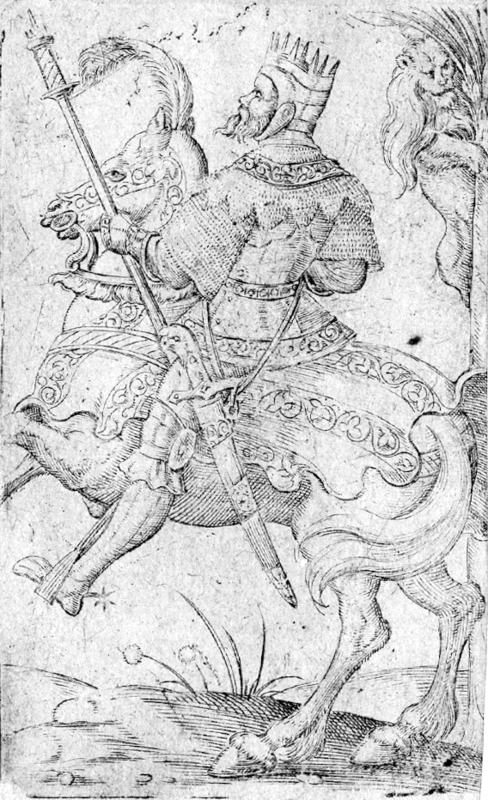 Both are walking in front of a doorway, but in the Catelin Geofroy card he is entering it, while he is leaving it in Tarot de Paris. 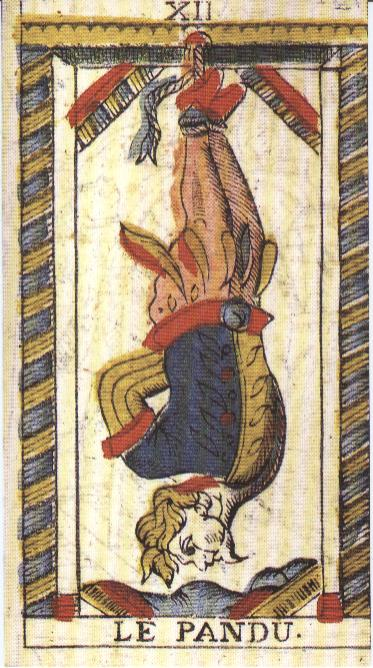 The hanged man cards share nothing of particular significance. 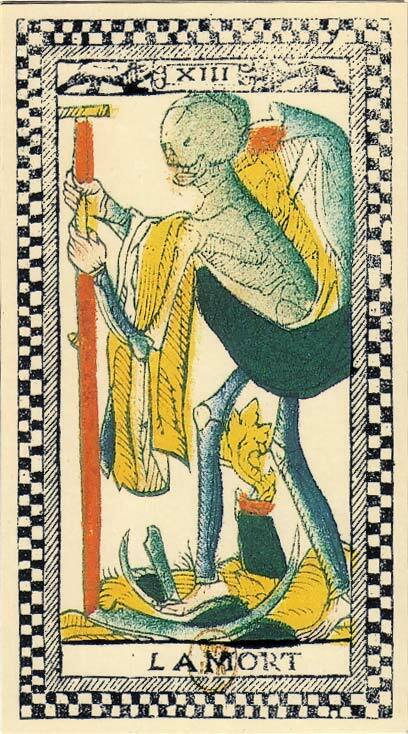 The death cards look quite dissimilar, but do in fact share some non-universal features. 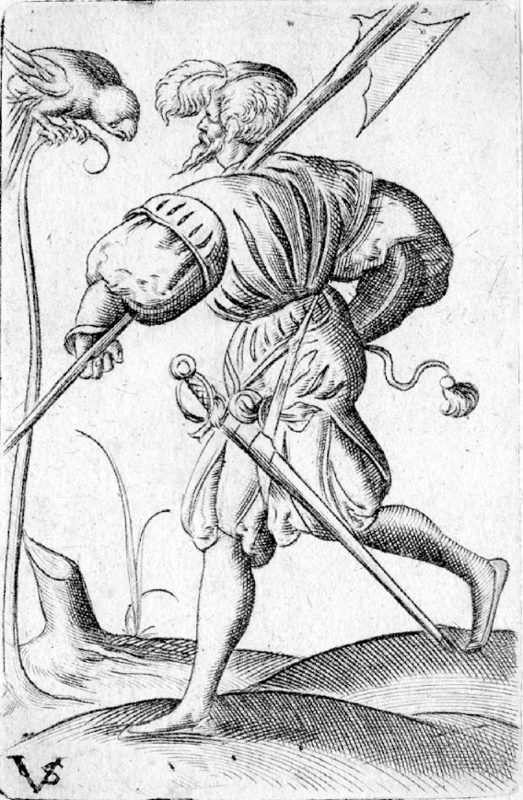 They contain a non-mounted animated skeleton with a long loose piece of fabric covering the loins. 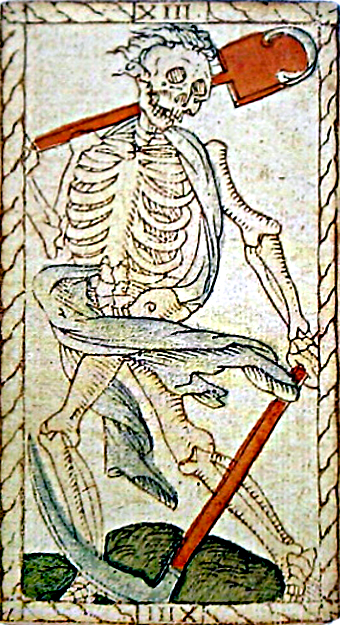 They carry a scythe (the Catelin Geofroy one also a iron-rimmed spade) but there are no bodies or body parts on the ground as in many other decks. 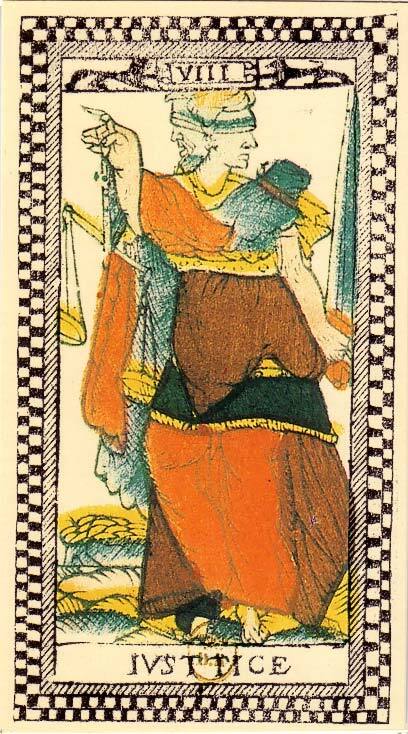 The temperance cards share little except both being atypical. 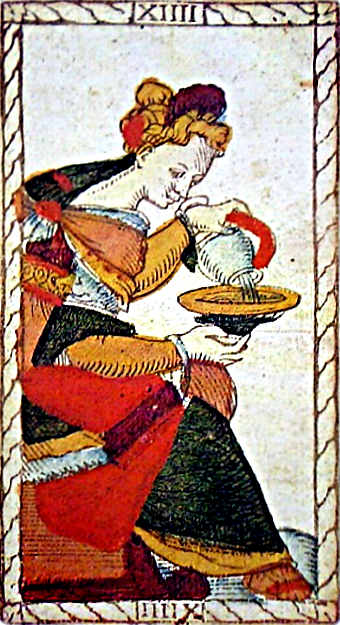 In the Catelin Geofroy card, the woman pours water from a jug into a bowl, rather than another jug; in the Tarot de Paris card she pours it on the ground, presumably to put out the fire behind her. 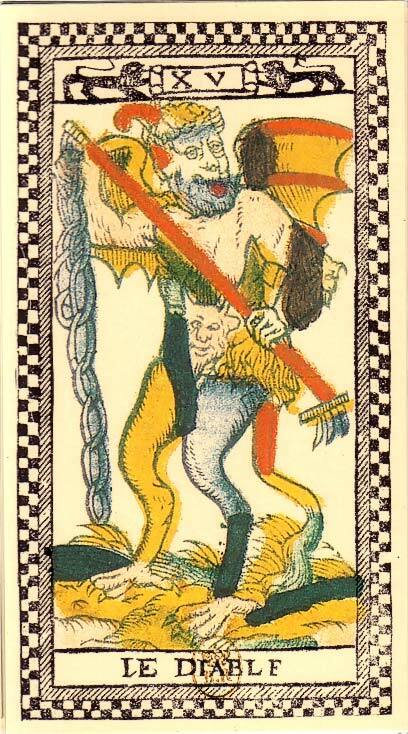 The tower cards do not match that name, nor fouldre (lightning) which is the title printed on the Tarot de Paris card. 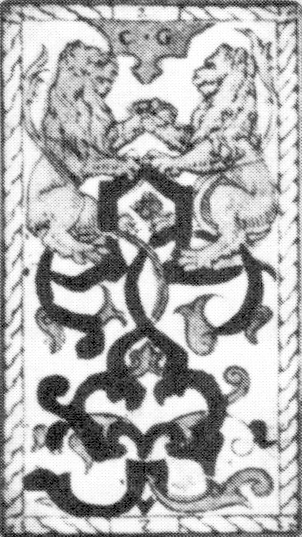 While dissimilar, both are probably representing the gate to hell; the Catelin Geofroy card might represent Orpheus and Eurydice. 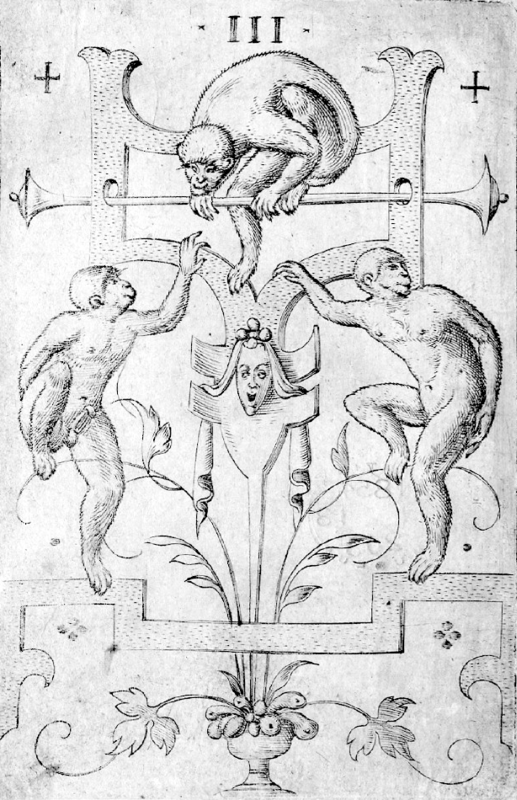 On that a man, a woman and a devil stand in front of a doorway above which there are windows from which fire and smoke erupt. 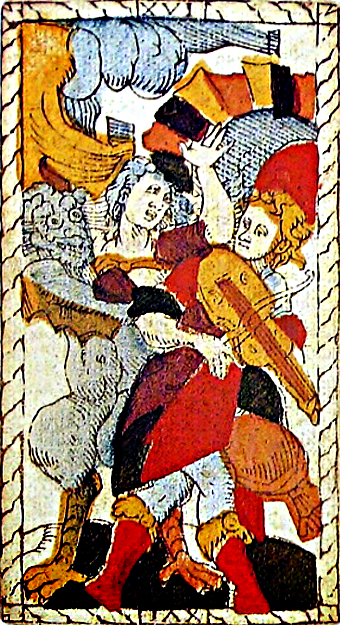 The man is playing the fiddle and is possibly looking back over his shoulder, where the woman seems to be grabbed by the devil at the same moment. 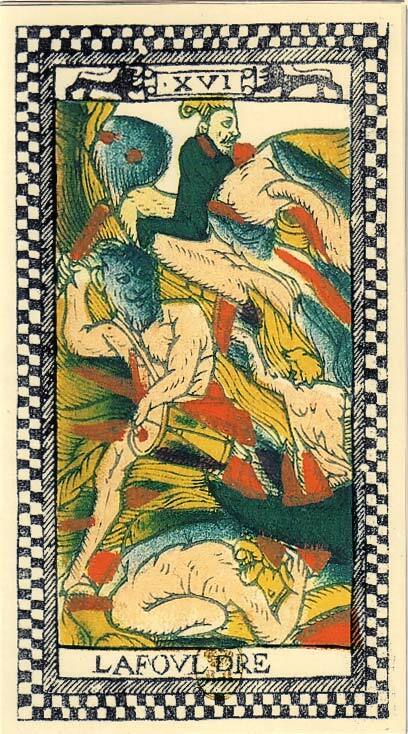 The Tarot de Paris card is quite chaotic. 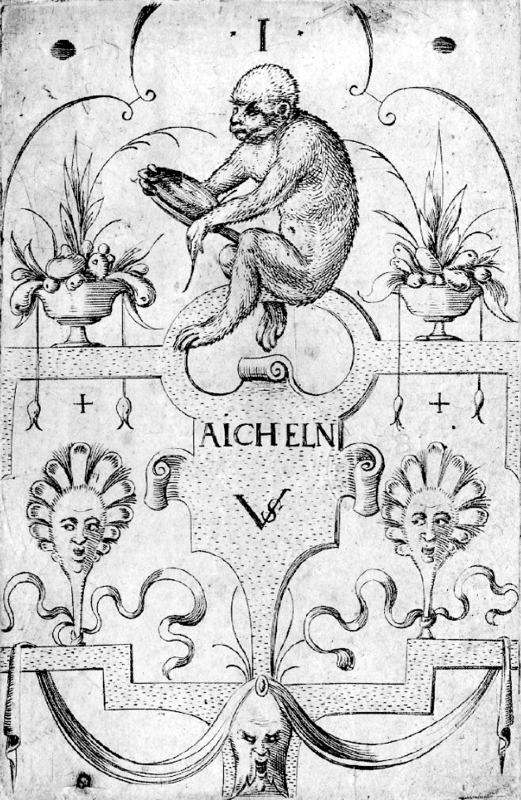 A smiling devil playing drums stands among the flames erupting from the gaping mouth of a huge monster's head. 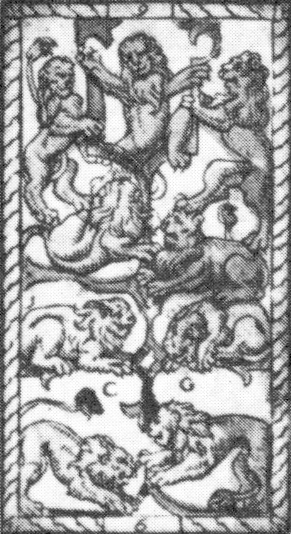 A man is inside the mouth, another one is cowering in front of it, and a third sits astride its snout. 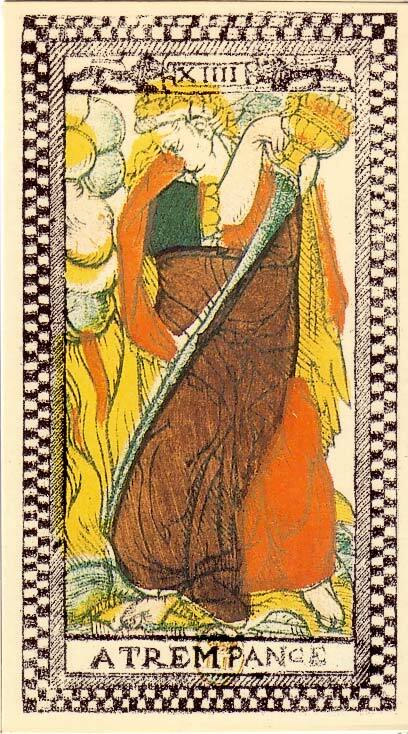 The judgement share most features, but these are so common across various decks that they are not very significant. 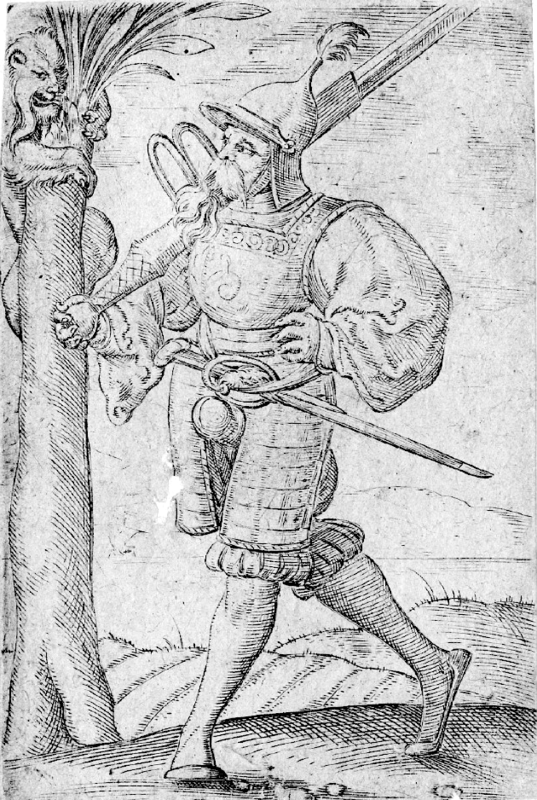 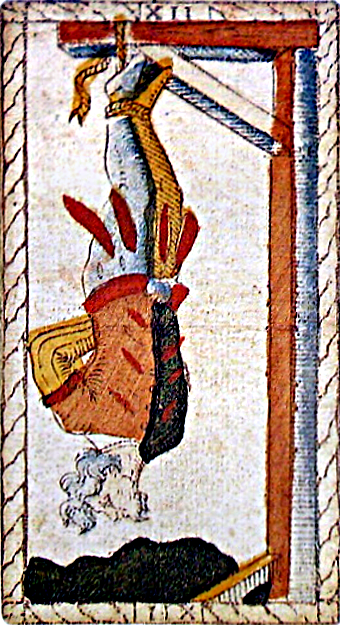 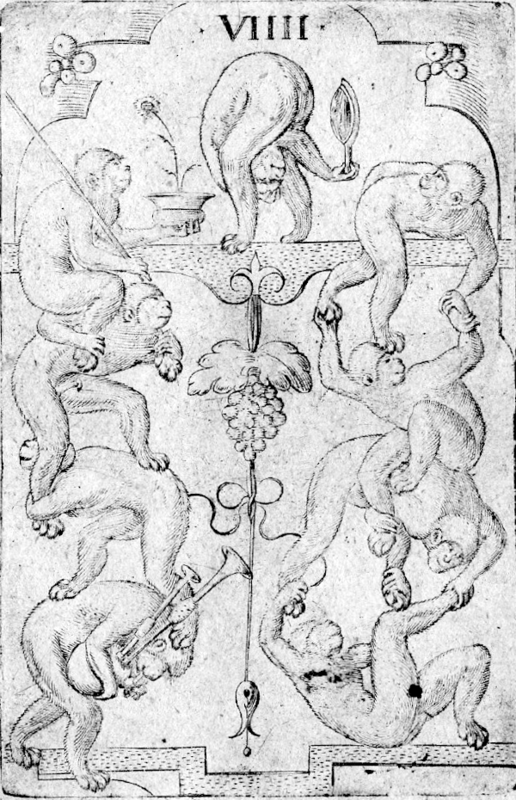 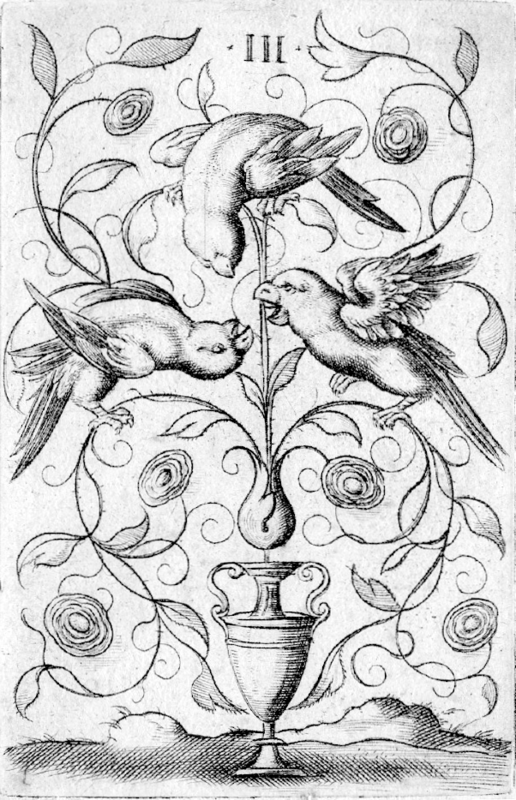 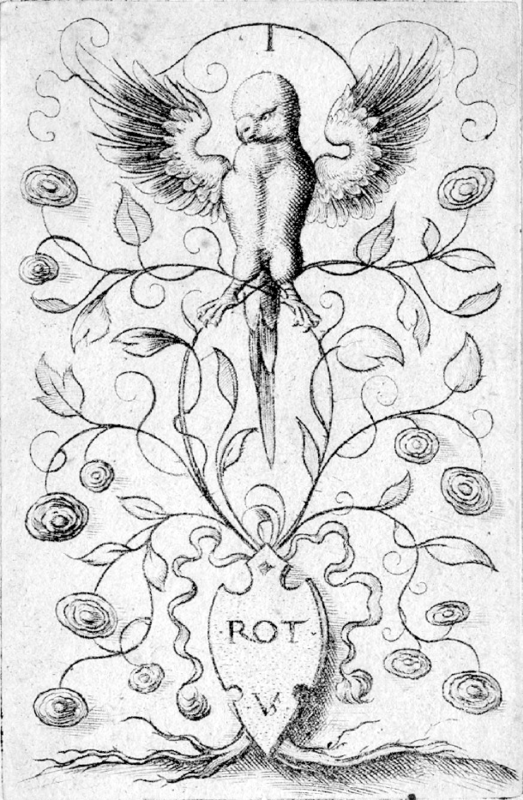 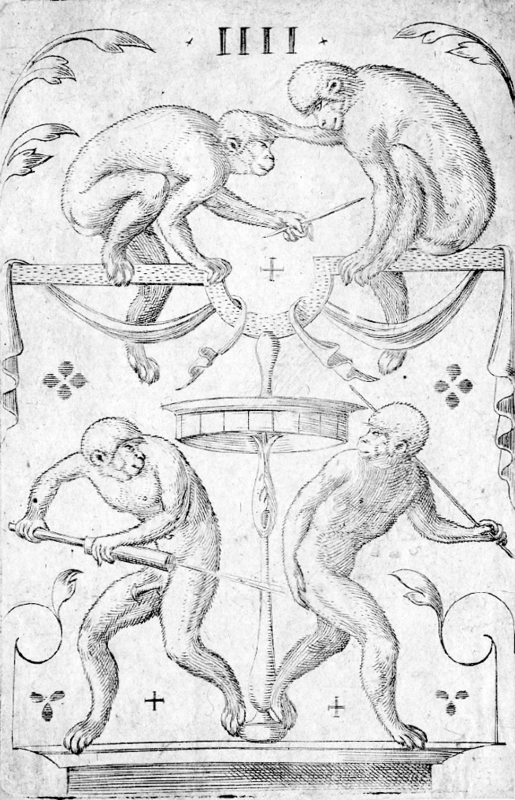 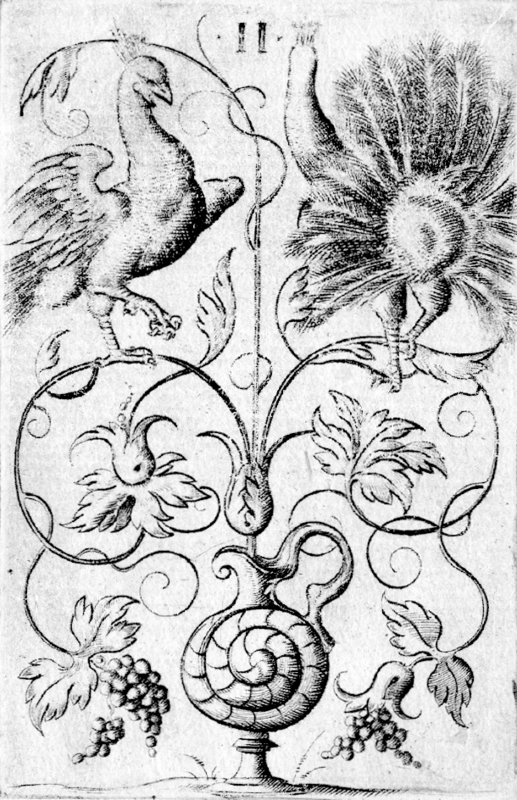 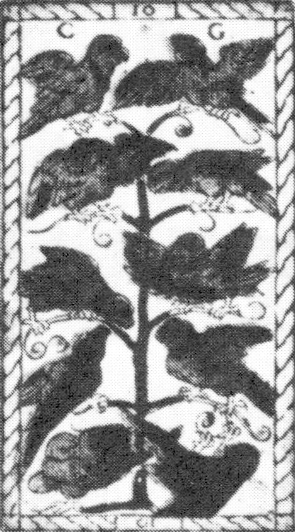 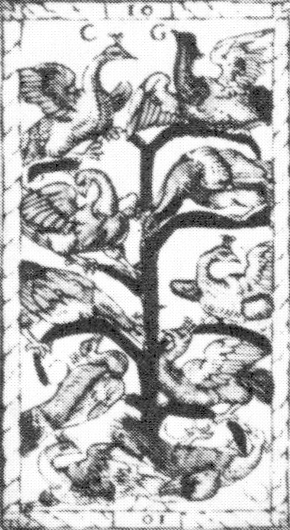 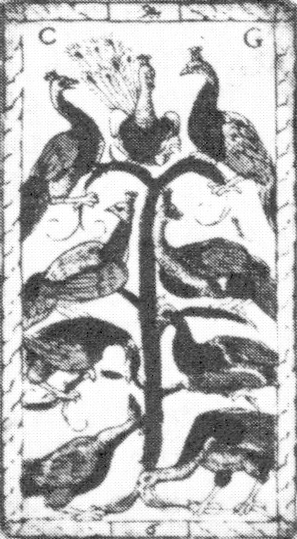 Some Swiss tarots otherwise following the Marseilles design pattern have a hanged man that derives through direct copying from the corresponding Catelin Geofroy card. 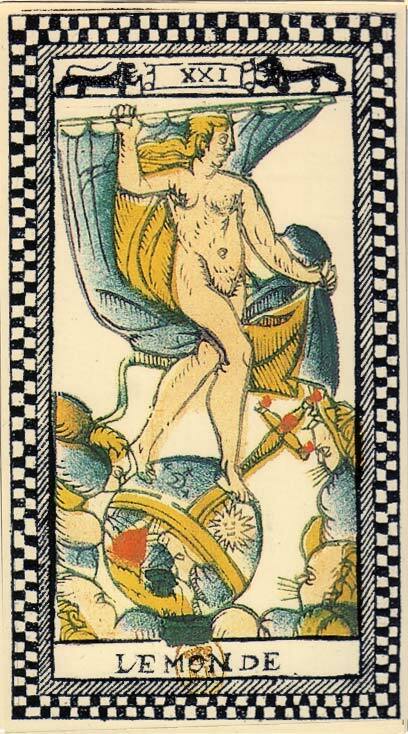 This deck is truly multinational. 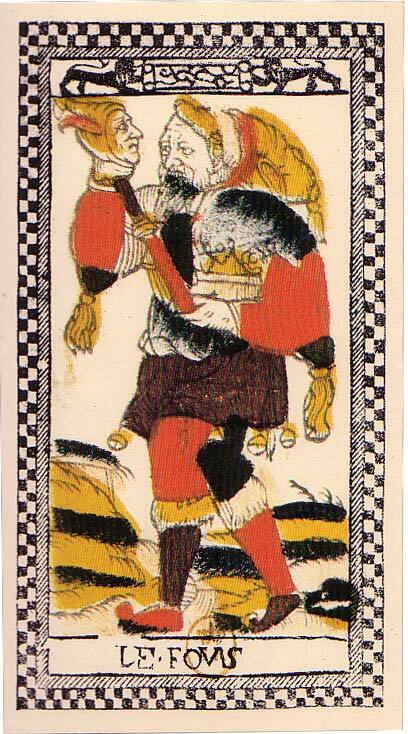 The suit cards are copied from a German deck, with a structure more common in France and indices based on the Italian language by a card maker known to be active in Lyons some years later – and the only direct copy of any of the cards were made in Switzerland.